An affordable alternative, the Huion KAMVAS GT-156 V2 is a versatile tablet, perfect if you want an upgrade from your drawing pad without breaking the bank. Do you love Wacom’s range of Cintiqs but cringe at the price tag? When you decide it’s finally time to buy a drawing tablet, or upgrade your current device, Wacom is often the first brand you think of. Most artists would love a Cintiq to work with. But they aren’t the most affordable option out there, especially for hobby artists interested in digital art. Below, I walk through the different features and benefits of the cintiq to help you find something similar but at a cheaper price. 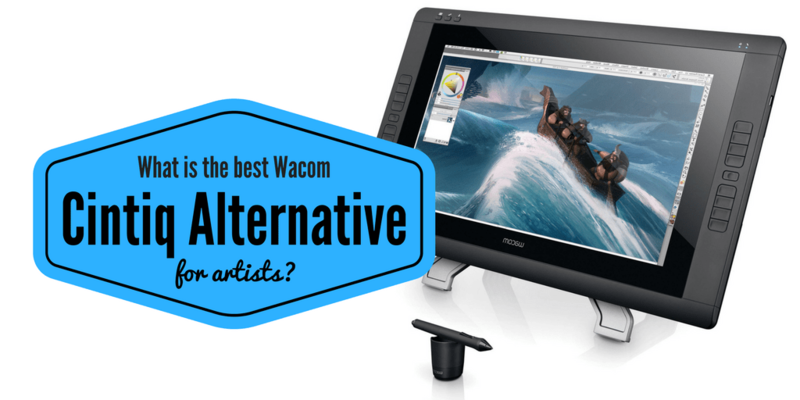 I then list what I think are five of the best alternatives for Wacom’s Cintiq range. 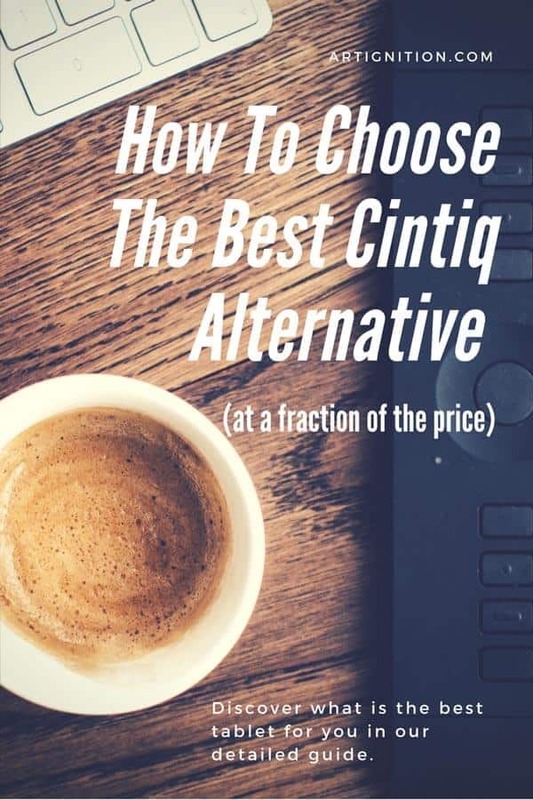 Why Is Cintiq Considered The Best? Cintiq is considered by many to be the industry standard. Wacom has been creating tablets for years. They are well known for creating reliable, long-lasting products, with a lot of key tech. In addition, many Wacom pens work with other devices, such as Samsung and iPad tablets. I always appreciate when products from different brands work well together as I’m a minimalist, especially with art supplies. If you have started out drawing digitally, tilt shouldn’t be a noticeable issue. But if you’re like me and are used to graphite or pencil you will likely appreciate this feature. Learn more about tilt here. Wacom is known for providing quality driver support. Their tablet drivers continue receiving updates long after a product is released. Their Graphire 3, for instance, continued getting them for 11 years after its release. Learn more about driver updates here. Color and screen quality are noteworthy on Cintiq products. The older 24HD, for instance, has a touch-enabled display that shows over a billion colors. It also implements RGB backlighting for improved on-screen color and covers 97 percent of RGB gamut in Adobe. Fortunately, it’s not hard to find alternatives that also offer great clarity and color quality. Almost every pen display tablet on our list has 1920 by 1080 screen resolution. That is the basic resolution for High Definition screens. Learn more about screen resolution here. Because of its success in the market, Wacom is known for providing great customer support. They have a forum where employees (or occasionally, other users) answer your questions. There are also Wacom customer support hotlines all over the world you can call if you’re having problems. If you have ever struggled with a tech product only to have no one to contact you about it, this is a relief. Their site is available in many languages and offers driver downloads for Cintiq products. If you’re tech-savvy and fine with doing your own troubleshooting, customer support quality may not be a deal-breaker for you. But ideally, the tablet you choose will come with a responsive support team. What Is The Best Way To Use A Cintiq Tablet? One of the most important things to do when installing your Cintiq is programming the stylus. This will allow you to assign and customize keystroke and scrolling options. The ability to scroll around or access menus with the push of a button will save you a lot of time. Although this is a feature Cintiq is known for, many alternative products also come with customizable pens of good quality. Wacom tablets come with a variety of useful buttons along the left side known as ExpressKeys. You can use these to quickly and easily access the functions you need. Like the buttons on the stylus, they can be used to assign functions to applications. These are great for artists who dislike interruption when they’re in the zone. This tutorial can give you a bit more information on configuring ExpressKeys. With so much choice in how to customize your device and stylus, it’s likely you’ll forget which button is which at least once. This is where the Express View feature will be of great help. To find out what a certain key is programmed as, just allow your finger to rest on it and the screen will show you. The Cintiq locks into place when put into an upright position, allowing you to use it like a standard computer screen. It can also be adjusted for comfortable use while standing. Since excessive sitting is bad for your health, this could be a welcome feature for some professionals or hobby artists. For tips on using and setting up your tablet stand, check out this page. Why Do Wacoms Cost So Much? Wacom tablets are known for lasting a long time. In fact, I’ve read about multiple artists still proudly owning the same product for over a decade. Wacom is at the forefront of tablet technology, though other brands are catching up. The stylus performance and LCD screen in particular call for extensive modification for their quality level. For this reason, the brand has built up a certain level of trust with its customers. This is why you’ve probably heard and read about people singing Cintiq’s praises more than once. But the price tag on a Cintiq is a bit shocking. When I first saw how much a 27QHD costs, my first thought was that I could probably find a used car for that price. If you’re a working professional digital artist or graphic designer, however, dropping this kind of cash could be worth it because you’d soon earn it back. It’s also worth looking for used, affordable Cintiq tablets. For the rest of us hobby artists (until we become famous, of course), spending that much is just not in the cards. But it’s perfectly possible to find a suitable alternative without sacrificing quality. Just look for quality pressure sensitivity, good screen resolution, and make sure the active drawing area is big enough for your needs. A suitable Cintiq 13HD alternative. 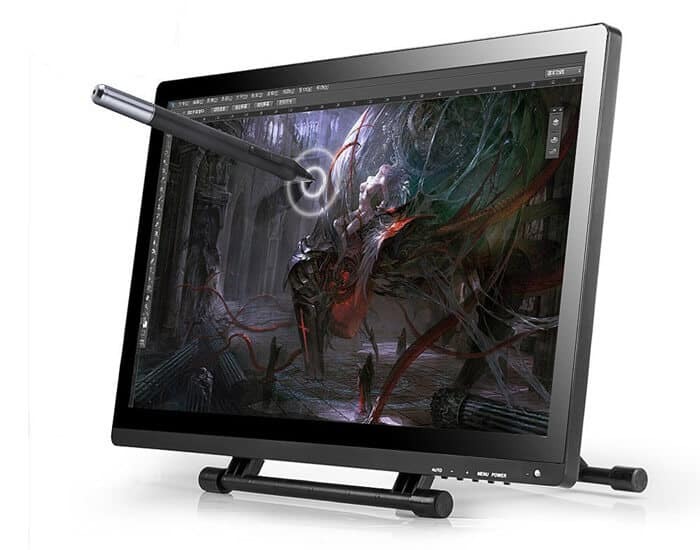 A suitable Cintiq 13HD alternative in terms of size, the Artisul D13 has 1920 by 1080 screen resolution. Like the Pro 13, it has 2048 levels of pen pressure sensitivity and is compatible with both Windows and Mac. There is a matte screen protector that comes with this tablet monitor, which is ideal for artists who prefer a natural, paper-like feel. It also reduces glare. As an artist who likes to work in a variety of places with different lighting, I would appreciate this feature. A Battery-Free Pen: The stylus never needs to charge, which is great for busy artists who don’t need yet another task to remember during the day. Lighter than other styluses, it comes with a case and has user-friendly buttons. Sturdy Stand: This tablet comes bundled with a stand. Though it’s lightweight and thin, it’s very sturdy. I like that it’s not built-in and is more of an optional feature. Easy Installation: The installation process of the Artisul D13 is straightforward and simple. The hot keys are easy to program, which is great for those who are new to using a drawing tablet. It also comes with a customizable quick dial, six quick access keys, and is USB-powered. You may need an Adaptor: The D13 only comes with an HDMI port, which could limit you, depending on your current setup. Compatibility: This tablet may not work well with certain open source software and may need additional programs set up if you have a Mac. The D13 has 7 hardware buttons included on its left side, just like the Cintiq. You can configure each of these for applications, Clip Studio Paint, and Photoshop. For an alternative to the 16-inch Cintiq tablet, there’s the GT-156HD V2 by Huion. This tablet monitor is 15.6 inches with an anti-glare screen. This feature plus 1920 by 1080 screen resolution give you a clear image even in less-than-ideal lighting. Light Stylus: The two stylus that come with this tablet is light and easy to hold. Since I’m used to working with pencil, this is the type of tablet pen I’d prefer. Pressure Control: The pressure control on the KAMVAS GT-156HD is smooth and gives good feedback. With 8192 levels of pressure sensitivity, this makes it very as good (if not better) to Wacom in terms of quality. 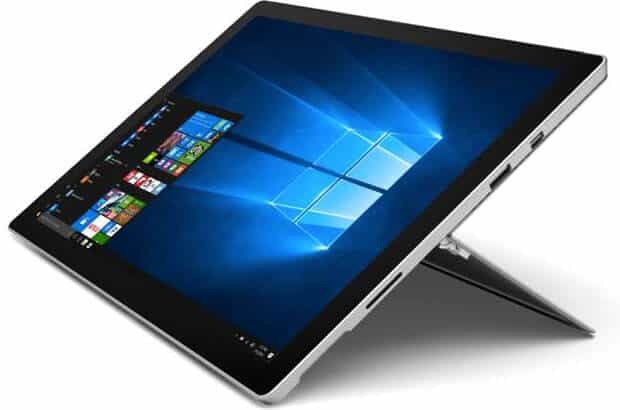 Suitable for Left-Handed Users: You may move the display connectors to the left side of the tablet monitor for a better working experience if you’re left handed. SD Card Slot: The screen comes with a micro SD card slot built in. This enables you to carry your projects with you regardless of which PC you’re using. For those who shift between a laptop and PCs, this accessibility will be a welcome change. The Stylus must be Charged: You must remember to put the pen back on the charger after every session or you risk it running out of power mid-project. However, with the release of version 2, you get two stylus. You can have one charge while you use the other. The Stand doesn’t Rotate: If you’re an artist who prefers to rotate the tablet physically instead of using program rotation measures, this could be a bit of drawback. No Touch Controls: If you’re accustomed to using gesture controls to rotate, scale, and zoom, the GT-156HD’s lack of touch controls may take some getting used to. If you’re looking for an alternative to the 22-inch Cintiq, the Artist 22 is worth looking at and has a 1920 by 1080 screen. 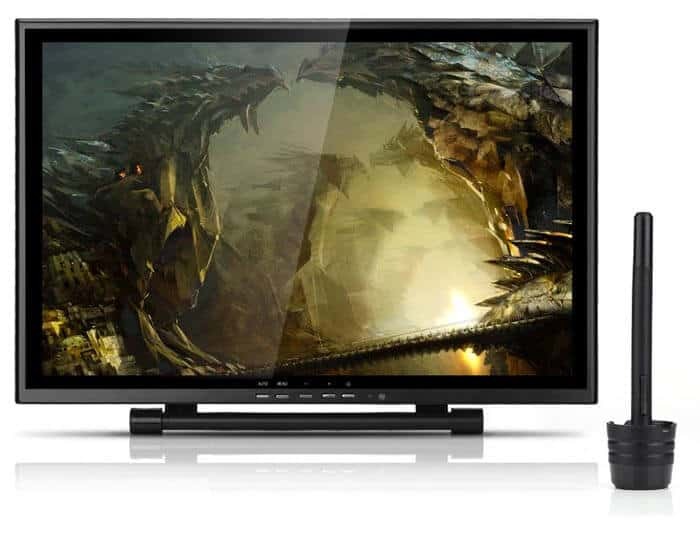 The Viewing Angles: This is an IPS monitor, meaning it offers rich colors and accuracy with various viewing angles. You will only see a little color degradation with extreme angles viewed from the side. Lots of Extras: The Artist 22 comes with a fair amount of extra items. This includes an extra stylus, cleaning cloth and brush, an adapter for Mac, a screen protector, and various types of cables. Programmable Stylus Buttons: Like the Cintiq, this option has programmable pen buttons to increase the efficiency of your work flow. No Rotation or Tilt Sensitivity: The Artist 22 doesn’t have these features as Cintiq does, but you may manually adjust pen tilt. Stylus Noise: The pen can, at times, make noise when you’re drawing on the screen. The screen protector may help with this issue, though. A Glossy Screen: Depending on your preferences, this could be a pro or a con. The glossy screen allows for brighter-looking colors but will definitely reflect light more. Unfortunately, there isn’t an alternative to the Cintiq 27QHD that really compares. But for its size, the Ugee 1910B is among the most affordable of Cintiq alternatives. This can be attached to a projector, your TV, or used with Mac or Windows. A Balanced Pen: This stylus isn’t too heavy or too light. Thicker than an ordinary pen, it’s heavy enough to feel balanced but light enough to prevent fatigue. Since you’ll likely be holding your pen for hours as you work, this is a key quality. Responsive Drivers: Ugee’s driver comes with a quality pressure curve that can maximize line variation. Depending on how you use this, it can work similar to a ballpoint pen, creating thin and accurate lines. Solid Build: The 1910B looks attractive and feels solid even though it isn’t very thick. It’s easy enough to carry from room to room but probably not comfortable to transport around town. Easy-to-Smudge Glass: The slick, glossy screen can be a downside to some as it’s easy to smudge and causes glare. The Cords Require a lot of Room: The cords on this tablet monitor make it quite bulky, which is inconvenient for those with limited desk space. Limited Customer Support: Ugee doesn’t have the best customer support. If you have any driver or general tablet issues, you can only contact them via chat or email. It could then take them quite a while to answer which may be frustrating. Drivers: The drivers for this Ugee aren’t as customizable as those of the Cintiq. The 1910B also doesn’t come with programmable express keys. 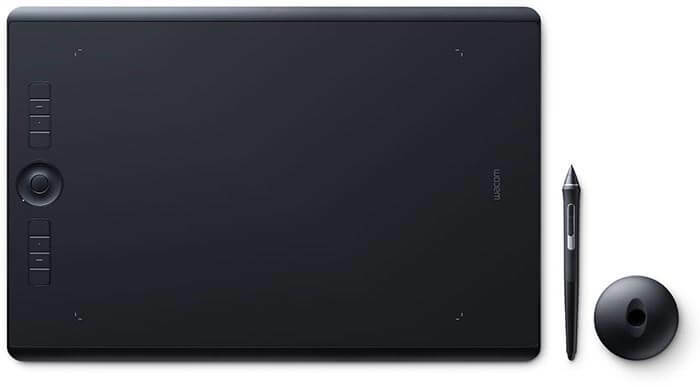 Like Cintiq tablets, the Ugee UG-2150 tablet has 2048 pressure levels and full HD resolution (1920 by 1080). Though it’s a similar size, I like that it’s lighter and smaller than the 22HD by Cintiq. Great Value: Those seeking a cheap Cintiq alternative will be glad to know that the price of this is almost 4 times lower than Cintiq. The Pen Holds a Charge Well: An inspiring art session means being able to draw without interruptions. Though you do have to charge the stylus, it will last much longer than many competitors’ products. This will mean having to pause less often. 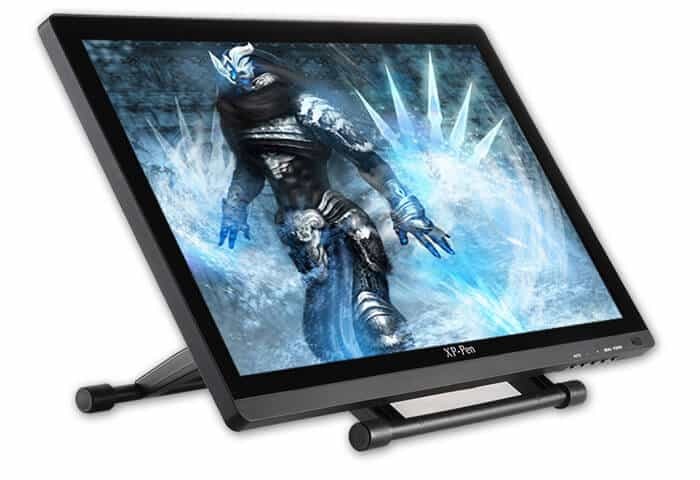 Sturdy, Adjustable Mounting Arm: Like the screen itself, the mounting arm feels sturdy, even if you have to move it a lot. Support Offered: This tablet supports VGA, DVI-I, and HDMI, so there’s no need for an adapter like there would be with a Yiyinova tablet. Limited Customizability: You will be quite limited with how much you can customize the stylus and drivers on this tablet. Cables and Cable Placement: This tablet comes with a bit of wire clutter which could get in the way. The cables also attach near the lower part of the unit which some artists will find inconvenient. Limited User Support: Again, Ugee doesn’t have the best tech support compared to Wacom. You could end up waiting days for an email reply from them. The most immediately noticeable difference between Cintiq and this product is the shiny glass screen. It also doesn’t have Express Keys. If I had to choose one tablet, I would say the best Cintiq alternative is the Huion KAMVAS GT-156HD V2. The 8192 pressure levels, new glare screen patented technology and the addition of a second pen has made the Version 2 of the GT-156HD far better compared to its previous iteration. The color quality, and display are on par with the Cintiq Pro 16HD however the GT-156HD doesn't have touch capabilities. The screen offers true colors and can also works as an additional monitor. Visible black shades are important in certain pieces and this delivers them. The pen is solid, comfortable, and while it’s charging you’ll have still an extra to work with. As an added bonus, it doesn’t put off a lot of heat like other products and is light enough to hold in your lap. So what do you think of our selection? What is your #1 alternative to the Cintiq? When moving from traditional art to digital art, my first step was using a drawing tablet. I enjoyed the freedom this gave me to start over an unlimited amount of times with my drawings and store my creations easier. But I found it hard to get used to not looking at my hand while drawing. I often noticed that I missed the simplicity of a lighter tool I could simply hold, look at, and bring everywhere with me. In retrospect, a portable drawing tablet would have eliminated this issue long ago. In this Cintiq Companion 2 Review, you’ll find out whether this tablet can help you simplify your creation process and draw faster. Traditional drawing methods can often mean broken leads, forgotten supplies, and messy pencil shavings. A drawing tablet can take care of all of these problems. Drawing tablets are ideal for people who prefer to have everything they need for their art in a compact, portable package. Portable tables are used for digital painting, 3D modeling, creating animations, and editing videos. All of these uses can require greater storage capacity for large files and RAM for processing 3D designs and complex images. When you move to a portable tablet, you will have to start thinking about battery. Do you often work in 3-hour chunks and have time to charge between, or do you need the ability to get lost in your creations for 8 hours at a time? The answer to this will help you decide whether a more portable solution is better for you. 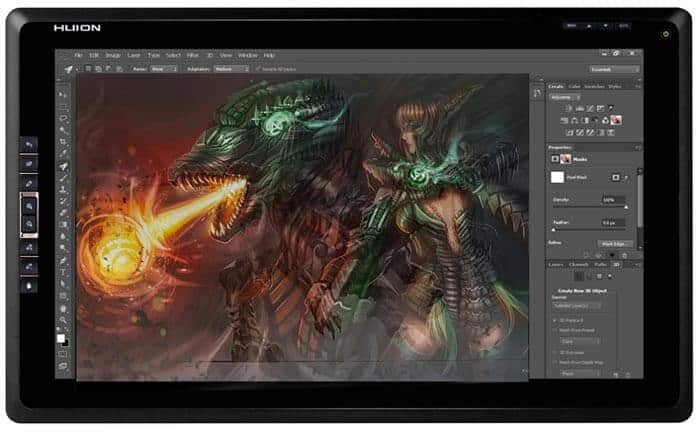 Not all tablets will support popular drawing and editing software. Consider what software you use, and check whether it is compatible on your desired digital drawing device. Drawing tablets are perfect for those who prefer a minimalistic approach to their creation process. They involve less mess, greater creative control, and better workflow. Drawing tablets can be thought of as many different mediums in one. Instead of paint brushes, pens, and pencils, you have a single stylus to use which can create a variety of strokes and lines. They also allow you to keep your creations in a single spot instead of needing to find physical space to store them. 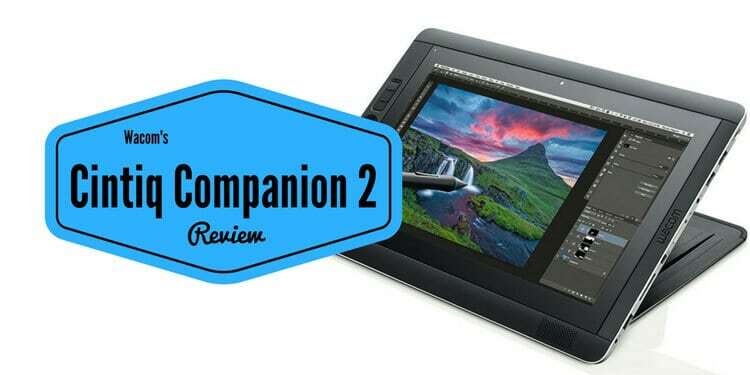 How does the Cintiq Companion 2 Compare? The Wacom Cintiq Companion 2 has a 13.3-inch screen and can handle creative software well. It comes with connection cables, a Pro Pen stylus, a soft carrying case, and an adjustable stand. Cintiq’s last generation of the same product only came with two models, while the Companion 2 has more variety. It isn’t priced as low as an iPad, but you get many more features specific to drawing and design. 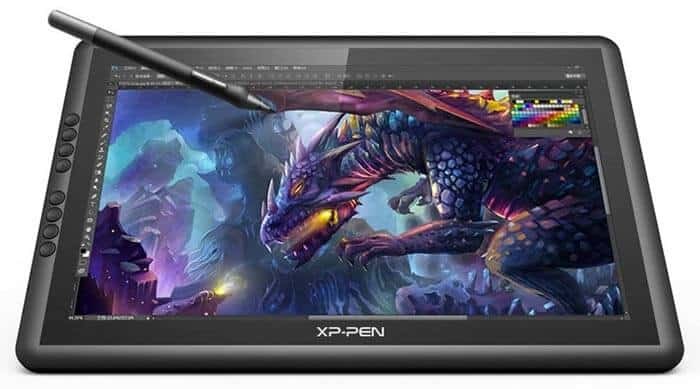 If you’re looking for the quickest, cheapest option out there in terms of a drawing tablet, this isn’t it, but it’s still priced affordably compared against most models. An Ergonomic Stylus: The pen comes with a comfort grip and flared design so you can use it for hours at a time without pain. An ergonomic design and proper holding technique are highly important for artists. Touch Gestures: Pan, rotate, or zoom seamlessly while you create with multi-touch gestures, getting all of those tiny details perfect and bringing life to your project. Shortcuts: The Cintiq can be customized with onscreen controls, side switches, and other shortcuts, saving you time. 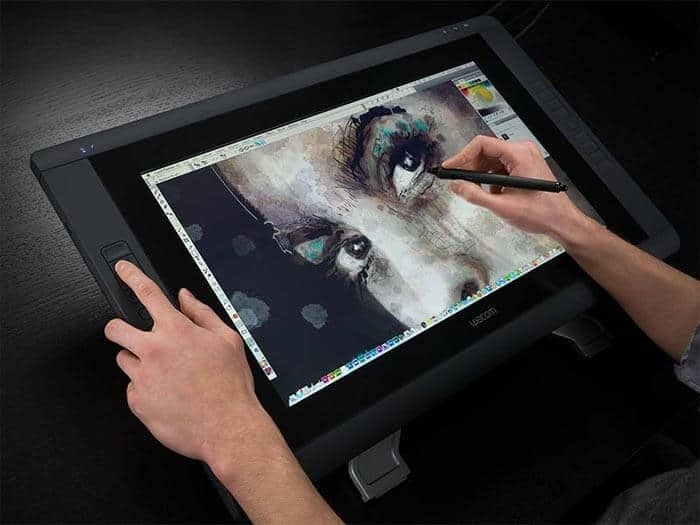 Compatible With Most Drawing Software: The companion 2 is compatible with most professional creative software. This include Adobe’s Creative Suite, AutoDesk, AutoCAD, Corel DRAW, Coral Painter, and much more. 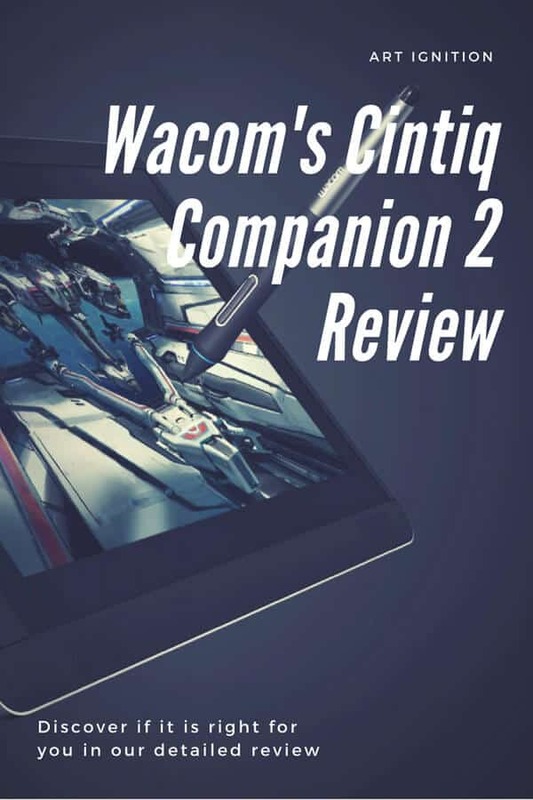 It’s Expensive: The Cintiq Companion 2 can be a huge upgrade for you if you’re looking to step up your art game, but it will definitely be an investment, and the quality of Wacom products is apparent for what you pay. Battery Life: The Companion 2 doesn’t have the greatest battery life and lasts 5 hours maximum if you’re using Photoshop CS5, while other tablets (like the Samsung Galaxy Tab S3 and iPad Pro) last closer to 10. Loud Fan: The fan on this tablet is quite loud compared with other devices. This tablet has 2048 pressure levels and feels more like pen on paper than other drawing tablets. If you’re someone who usually prefers traditional drawing methods, it’s great not to have to sacrifice that familiar sensation. If you are new to drawing tablets, you can learn more about how stylus pressure works here. I’ve never really appreciated the “drawing on glass” feeling that other tablets have, so a more natural feel is a plus. You will have access to a variety of nibs for the exact stroke you’re going for and can tilt the stylus to get the angle you want. This may even end up feeling more natural to you than a pencil after a while, but does come with the downside of needing to be charged. 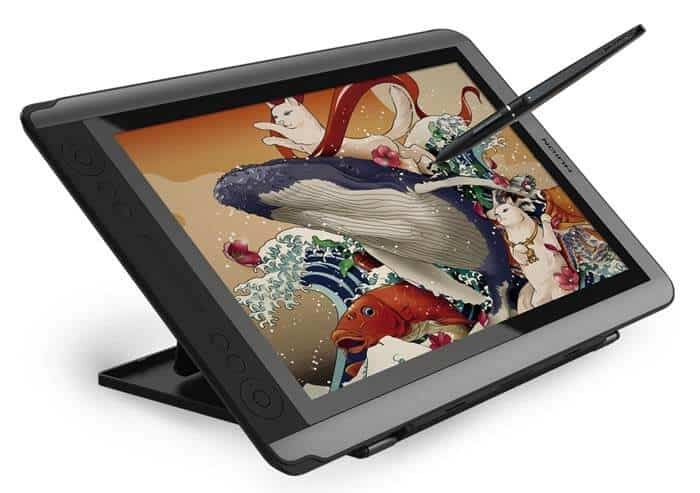 The Cintiq Companion 2 has a 13-inch screen with 2,560 by 1,440 WQHD with 16.7 million colors. The screen has a matte finish that won’t turn mirror-like or reflect light when you use it outdoors. This would have been very useful for me to have for drawing during my breaks at work, when the weather was too nice to pass up but my iPad screen was too reflective to draw on outside. But keep in mind that a matte screen means slightly dampened colors. Glossy displays offer more contrast and deeper, more vivid colors. The colors will look more saturated and intense, with blacks looking darker. Reflections on these screens do make them virtually unusable in brightly lit locations, however. If you’ve never owned a matte screen and aren’t sure whether it will work better for you than a glossy finish, ask yourself where you plan to use the device most. 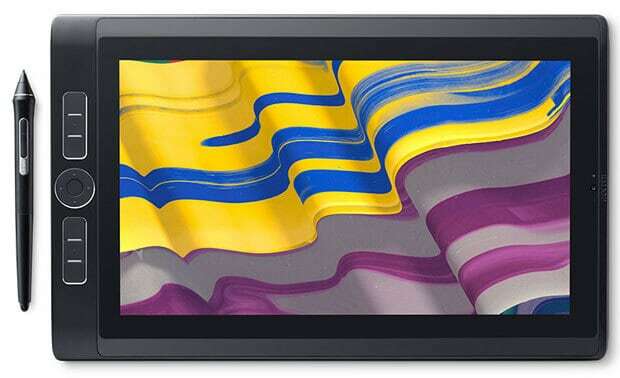 If you are buying a tablet that will mostly be used in a dimly lit room, the bright colors offered by a glossy display could be better than a matte screen. If you want to be able to use your tablet in a variety of settings or outside on bright, sunny days, a matte display will lessen glare. Portability is a very sought-after trait in electronic devices, especially drawing tablets where the entire point is bringing it along when you travel. 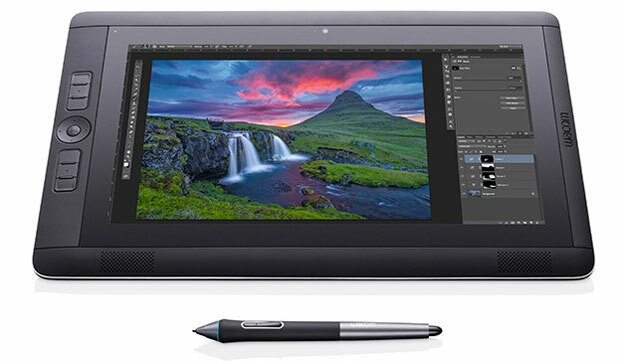 The first generation Companion by Wacom weighed nearly 4 pounds and while the Companion 2 isn’t a whole lot lighter, it’s steadily changing for the better and now weighs 3.75 pounds, instead. Wacom Companions aren’t as convenient to hold as a sketch pad and are still lap devices that you must sit to draw on comfortably. While the weight of this generation isn’t very different from the original, it’s spread evenly throughout the tablet. 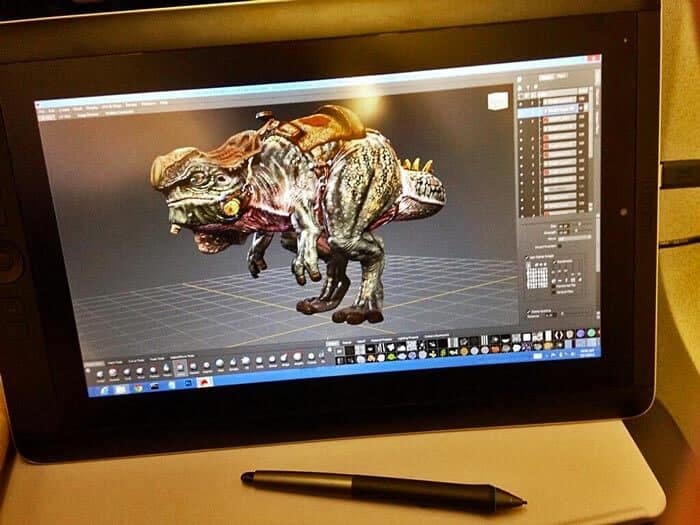 The design is very similar to the Cintiq 13HD but for a tablet with a computer inside, it’s a sleek device. The comparatively light weight of the tablet also means that if you want to import it from overseas, you won’t have to pay absurd shipping costs. The Cintiq Companion 2 shouldn’t be thought of as a replacement for your desktop computer, but as something you can use while you’re out and then connect to your laptop or desktop once you get home. 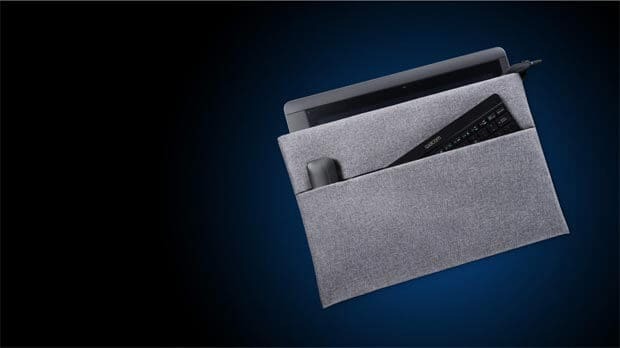 The Cintiq Companion 2 has venting slots at the back, along with slots for connecting the stand. It can be used as a standalone device with Windows 7 and Windows 8.1 or attached to your PC or Mac. This versatility makes it a step up from tablets that must be connected with a desktop or laptop to function. The model comes with a TPM chip and vPro technology for your security and has many connectivity options. Among these options, you will find three USB ports, two card slots, Bluetooth connectivity, Wi-Fi, two speakers, two HD cameras, a mini display port and an audio combo port. All of these features and options could be useful for artists looking to simplify their digital creation process by only needing a single device instead of many. Keep in mind that unlike some competitor’s models, if you want to use a keyboard with the Companion 2, it must be purchased separately. A noticeable improvement in the Cintiq Companion 2 is that it doesn’t run as hot as its predecessor. Though this does mean that it’s louder, the tradeoff of a more comfortable experience could be worth it to some artists. Using a loud tablet in a quiet library, for instance, can be a little embarrassing, but to me isn’t nearly as inconvenient as a device that feels like it will spontaneously combust in my hands at any moment. You must think about what you value more; silence or the ability to use your device for hours without it getting too hot. The Companion 2 offers some of the best capabilities available relative to its weight and size. It enables you to carry the strength of an actual PC in your bag. If you wanted to, you could even use it as a replacement for your desktop or laptop which could save you some money overall. I would primarily use a portable tablet like this for its video editing capabilities and zoom features to get more detail, but others may use it in entirely different ways. 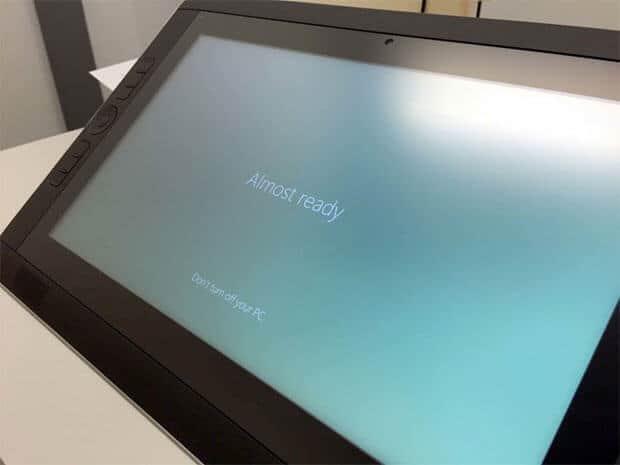 To find out more about how the Cintiq Companion 2 worked for actual artists, I scoured the web and found a few user reports discussing their journey with the device. …the first gen Companion ran on 1080p, while the Cintiq Companion 2 [runs] on QHD, and the difference in the resolution and the image quality is absolutely huge, and besides that, it also gives you a lot more room on your canvases in digital art programs when working on the device, which is a huge bonus for artists because then your tools take up less space on the screen. If you are a professional graphic designer and you are looking for that high quality display and you do love to travel and your work takes you all around the world this could not be a better product. If you need something a bit more advanced, the Mobile Studio Pro came after the Companion 2 and has a wider range of features and will cost you about the same amount. Runs with Windows 10: The computer is powered by more recent processor technology and runs Windows 10 rather than Windows 7 or 8.1. Like the Companion 2, it can be used as a standalone device or connected with your PC or Mac and used as a display. Better Pressure Levels: The Wacom Mobile Studio Pro has been designed with a new and improved stand and has 8192 instead of 2048 pressure levels. 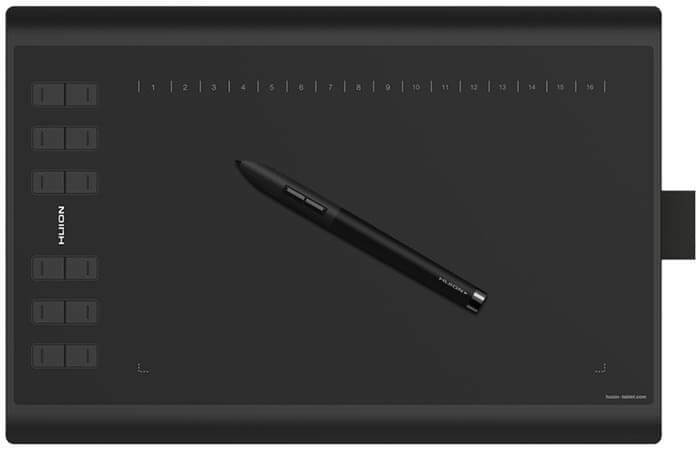 The Wacom Mobile Pro 13” could definitely be worth considering if you’re a professional considering alternatives to the Companion 2. It may be more expensive, but it is one powerful machine! 1024 Levels of Pressure: There is a tradeoff with the lower price point as this tablet comes with 1024 pressure levels instead of 2048. This makes it suitable for beginner artists but less suitable for more advanced artists who need a lot of control. I don’t consider myself a beginner artist, so 1024 probably wouldn’t be enough for me, personally. Cursory Accuracy: The Surface Pro 4 does have better cursory accuracy near the edges of the screen, though. It also has the benefit of coming with a keyboard instead of needing a separate one like the Companion 2. When comparing the Companion 2 and this version of the Surface Pro, the screens come very close in terms of resolution. If you need to use your device for a lot of typing and need something a bit more affordable than the Companion 2, check the Microsoft Surface Pro 4 out. 2048 Pressure Sensitivity: Like the Companion 2 (and most other drawing tablets), this option comes with 2048 pressure sensitivity. An Included Keyboard: The Lenovo Yoga Book also has a keyboard included, unlike the Companion 2. Use the 360 hinge to switch between using it like a laptop or tablet. Limited functionality: The Yoga book doesn’t have nearly as much functionality as the Surface Pro and Mobile Studio pro. It does run professional creative programs such as Adobe photoshop, however, if you try to use any of the slightly advanced features, you will run into problems. Having to remember a variety of art supplies every time you leave the house isn’t convenient, but neither is having to purchase multiple devices or stay confined to one area just for a digital drawing solution. If you looking for a convenient, powerful and portable drawing tablet then consider the Companion 2. The Cintiq Companion 2 doesn’t need a computer to work, offers more flexibility in your creation experience, and can run useful software to take your art to the next level. It also doesn’t require sharpening! Click here to check out the Cintiq Companion 2. Want to learn the secret to balance in your art? Would you like access to a tool that geniuses from the Renaissance age implemented in their work? There’s a formula that can help you with that. It’s been used for centuries but is still unknown to many modern artists. 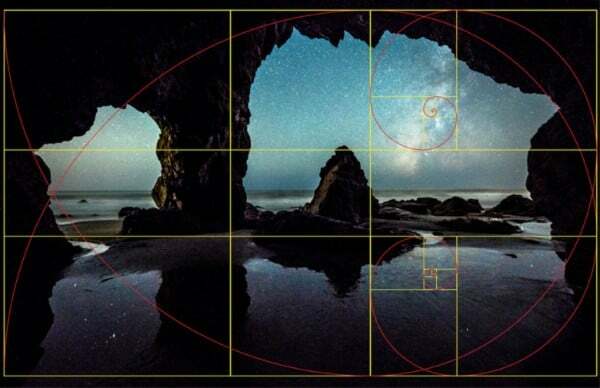 Thankfully, there are some fairly easy ways you can begin incorporating this golden ratio in art to create visually stunning work. 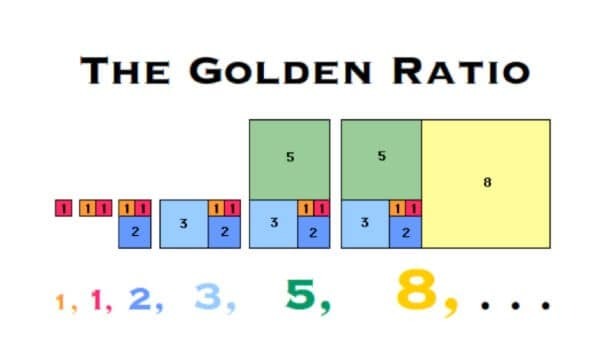 How Will You Use the Golden Ratio? 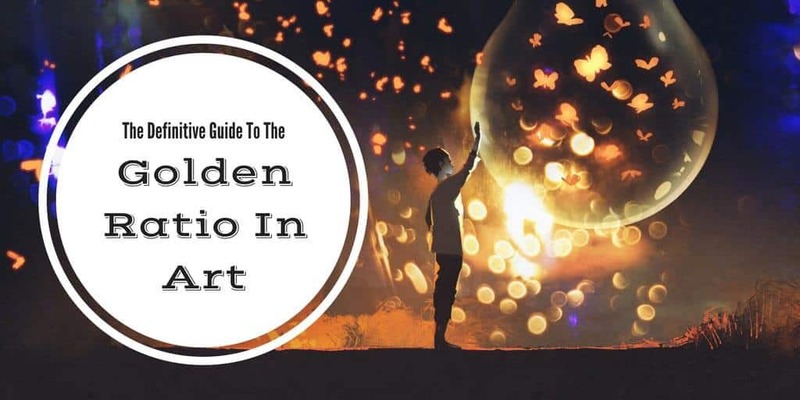 So, what is the golden ratio and how is it relevant to your art? It’s an irrational number (like pi) that has some unusual properties. The ratio is 1 to 1.618 (or 1.618033988749895…) and this number is, unlike pi, a quadratic equation solution. Wait, come back! I know math can be an intimidating (or if you’re me, downright scary) subject for many of us artists, but I promise I’m getting to the good stuff soon. This ratio is also called The Divine Proportion, phi, The Divine Section, The Fibonacci Ratio, The Golden Mean, or denoted by a phi symbol (Φ). The sequence of seemingly random numbers is fascinating because it appears frequently throughout nature, for starters. You will find it in shells, plants, and bone structures. Taking it a step further, you’ll find it in the reproduction patterns of rabbits. 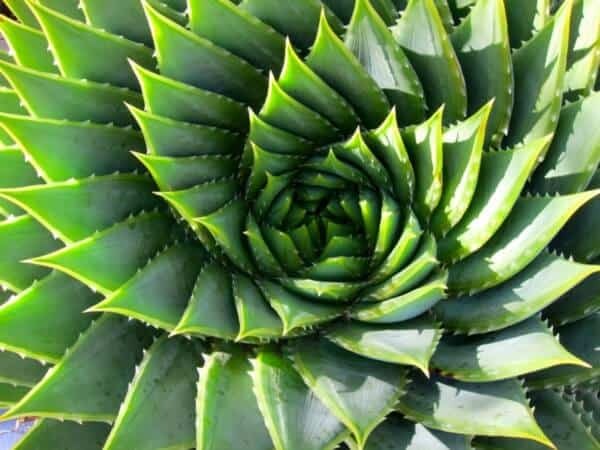 The Fibonacci sequence truly is a fascinating rabbit hole (excuse the pun) to venture down. This ratio has been used, both intentionally and unintentionally, by designers and artists for ages. There is something intrinsically fascinating about this pattern, which manages to balance asymmetry and symmetry in a visually pleasing fashion. The golden mean ratio can often be found depicted as a square and rectangle forming a big rectangle. This may not seem that interesting, until you realize that this sequence can be repeated perfectly and infinitely within the section. Truthfully, scientists haven’t pinned down the exact reason why the human eye is so drawn to images with the golden ratio. But it’s been proven that we like it. Research suggests that even tiny changes that make an image closer to this ratio greatly impact the brain of the one looking at it. The golden ratio is a powerful number present in and woven into our world. Seeing this ratio feels undeniably, intuitively right to our brains. Some believe its familiarity is what creates its beauty, as it can be found even in the human body. 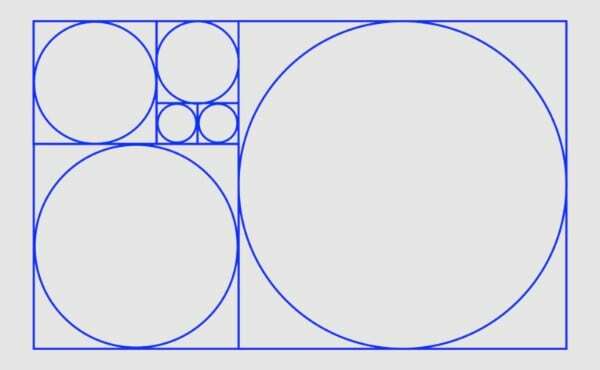 A Duke University professor, Adrian Bejan, believes that he’s figured out why we find images honoring the golden ratio so visually pleasing. And according to him, our eyes are capable of interpreting pictures with the ratio quicker than any other type of image. Animals (including human beings) have our vision oriented horizontally. A wild animal scans the horizon for danger, allowing him to both move faster and see better. We have evolved to do the same, and according to Bejan, shapes that are true to the golden ratio facilitate easier scanning and the transmission of images to the brain through vision. How does this relate to the golden mean and how we create art? The idea is that we will feel pleasure when our eyes find something on the horizon helpful to survival, such as shelter, a mate, or food. So seeing the golden ratio with its main subjects of interest oriented this way brings us pleasure through its beauty. How can you begin using this magical ratio in your artwork to create compelling pieces? If the idea of using math sounds like a stifling idea to you, you may find it helpful to consider it a general guideline. A general rule or theme to create from can lend you more freedom in your pieces as the guesswork of placement and proportions will be minimized. Think of this as a useful tool instead of a strict rule. In fact, you might even use it already without knowing it! 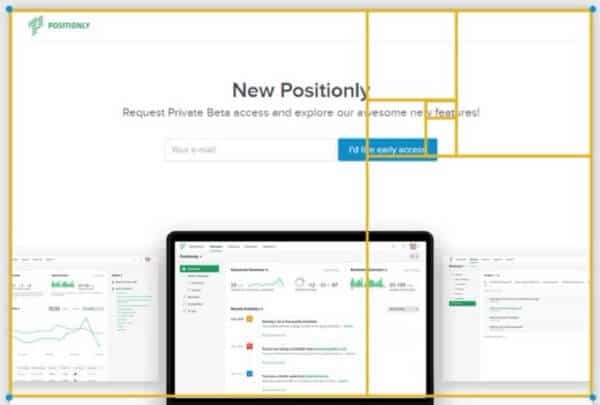 Basically, the golden ratio can be used to choose the placement and size of your art’s content, whether it’s a website you’re designing or a digital character piece. You can choose the general size of the piece’s layout using the golden rectangle, place focal points where the golden spiral would go, or use a combination of all techniques. We will give you some specific examples (in photography, web design, and more) to gain inspiration from in a bit. But for now, let’s start with the basics; creating a golden rectangle that can be used as a simple base for your work. If you want to use the golden ratio art, your first choice will be which shape to focus on. The most familiar shape associated with the golden ratio is the rectangle. And the most visually appealing rectangles are golden rectangles. Make a 1x1 square. This will be the smallest square on your canvas. Create another equal size square to the right of the original square. Create a 2x2 square under your original two 1x1 squares. Now create a 3x3 square to the left of the first three squares. 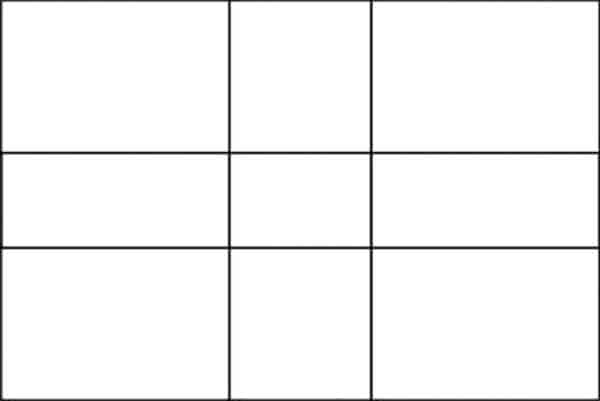 Lastly, create a 5x5 square that goes above this group of squares. You just successfully made a golden rectangle using the golden ratio. ​Learning more about how this works can offer you extra inspiration, if you’re the rare artistic type who likes to think about numbers. If you prefer simplicity, we’ll give you some tools that will make it easier later in the article. For most artistic purposes, the golden rectangle will be easiest and most useful, but that’s far from all you can use the golden ratio for. It’s also possible to use circles in a similar way. You can make a golden ratio using circles instead of squares. If you want to be precise about it, it may be easiest to start with the squares and then fill in the circles. It’s even possible to make a golden triangle spiral, which we will get to in a moment. If you’re working with a composition using diagonal lines, you can use golden triangles to create more visually appealing art. This involves a series of triangles with the same shape. You can place your subjects of interest inside these triangles to create a balanced piece of art. Alternatively, you can create a golden spiral shape using triangles. For this you’d use an isosceles triangle (a shape with one distinctive side and two equal sides, creating a golden proportion). You could then put these triangles together to create the spiral shape. You can use a grid based on the golden ratio to ensure your illustrations, logos, or images are visually sound. A grid is a good way to find minor adjustments in subject placement that you need to make or to find a good guide for where to crop. It’s just a generally helpful strategy for a more organized finished product. The Altrise Golden Section Grid Software is one option for implementing the phi grid in your work. Where Can You Find The Golden Ratio? 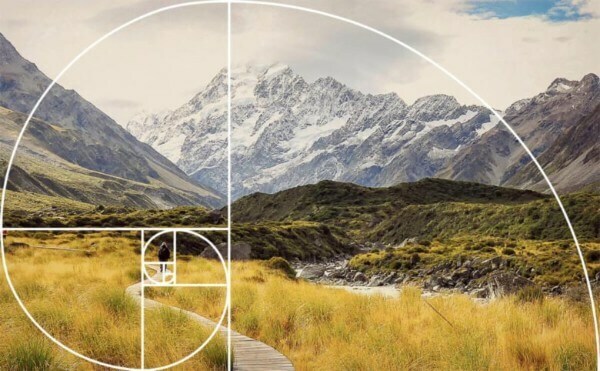 The golden ratio is present throughout the world in design, the human body, nature, photography, art, and more. It seems to be nature’s favorite equation. 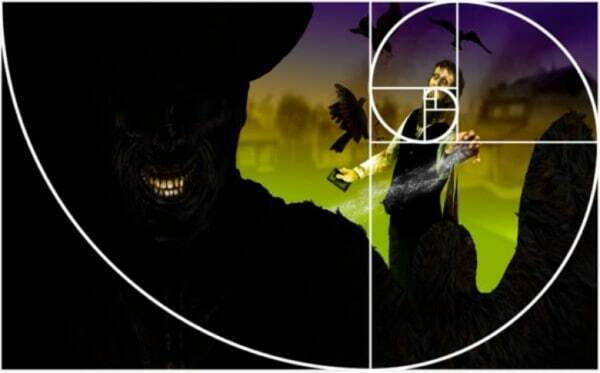 The golden ratio has been used for centuries and is no stranger to High Renaissance art. 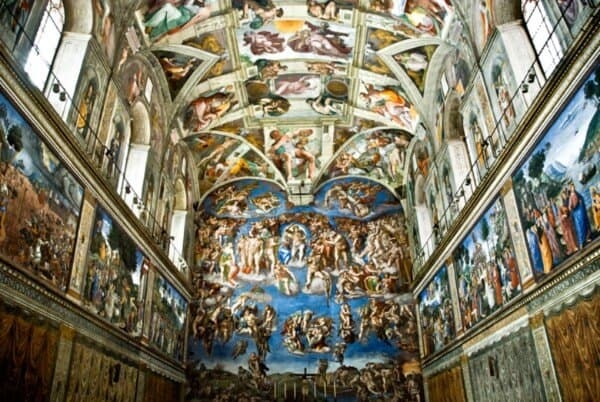 For instance, it appears over two dozen times in the famous Sistine Chapel alone. We will cover some specific examples from this later. The Fibonacci sequence has been used for ages in architecture. The golden ratio appears in the Great Pyramid of Egypt. The Parthenon in Greece is another famous example of the ratio and features a rectangle true to golden proportion. 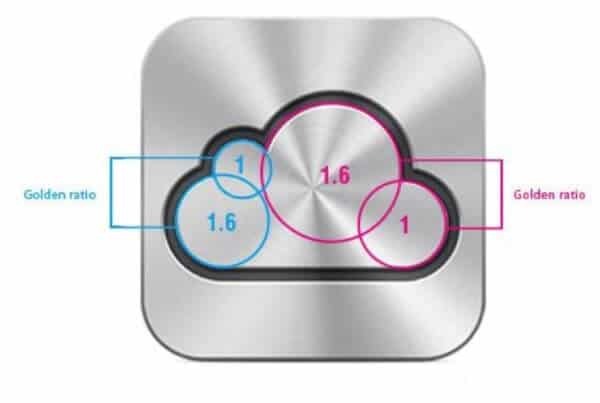 The golden mean can also be found in various designs and logos, including the iCloud logo. There is also rumor that the Apple symbol was designed with the ratio. Faces are considered more attractive if they are in proportion and somewhat symmetrical, like the golden ratio. A study done in 2009 found the ideal ratios for attractiveness. Visual creators, such as photographers, often incorporate the golden mean into their projects. One common way to do this is positioning the focal point of a photograph where the golden spiral’s curl would be. You won’t have to look far to find the golden ratio in nature. 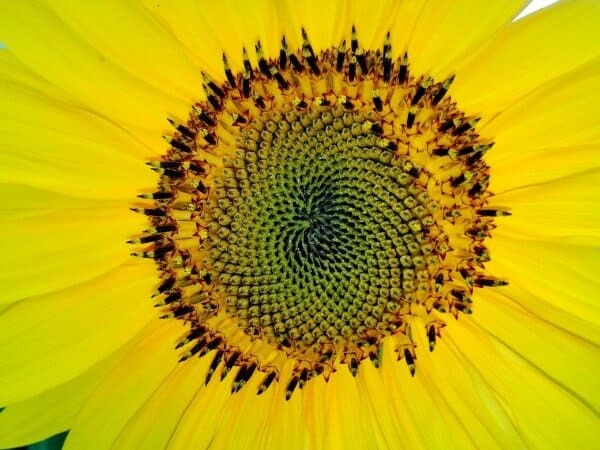 The Fibonacci spiral can often be found in the heads of flowers, the formation of petals, and shells. Pine cones are another good example of this phenomenon, along with this absolutely crazy-looking broccoli. 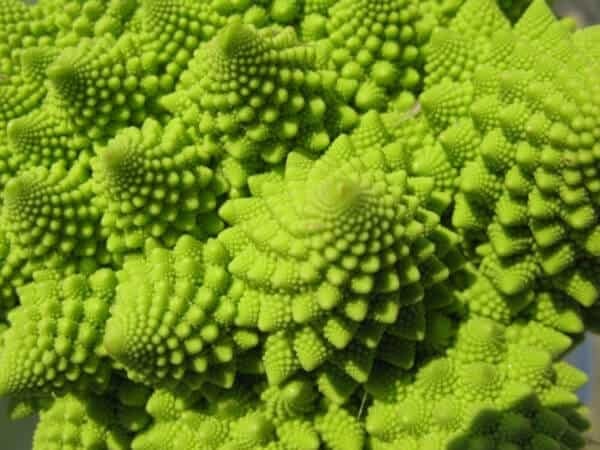 The beauty of this broccoli is undeniable. And your art can be just as beautiful if you learn how to use the golden mean correctly! But first, let’s start with a guideline you might be a little more familiar with using. The way you crop and frame images has a large impact on how the viewer feels about your art, even if they aren’t aware of it. This section will cover two different ways to structure images to make them more visually appealing and engaging. The rule of thirds is a simple, common composition rule that photographers have been using for ages. This guideline involves envisioning two sets of parallel lines running perpendicular to each other. The end result is nine equal-sized boxes across the canvas or layout and four intersecting points. 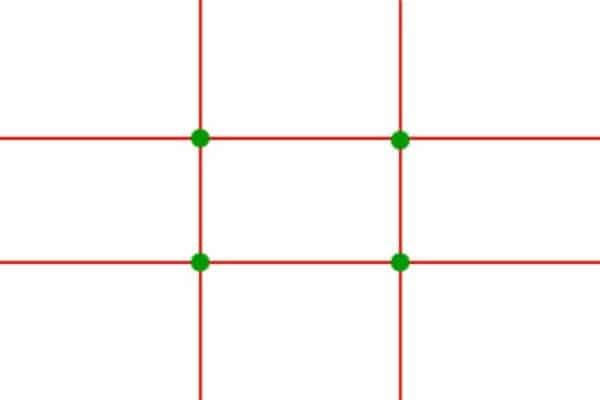 These points are “sweet spots” where it’s best to place subjects of focus, illustrated by the green spots below. Our brains like efficiency, so when the eye can easily focus on the composition subject without having to search, it’s satisfying. The rule of thirds offers a good solution for this. Gives your image equal weighting and visual harmony. It’s easy to implement due to its symmetry. You have a lot of choice with “sweet spots” to place subjects. May come across as too divided, depending on your subject matter. The forced symmetry can feel too perfect and not organic enough. 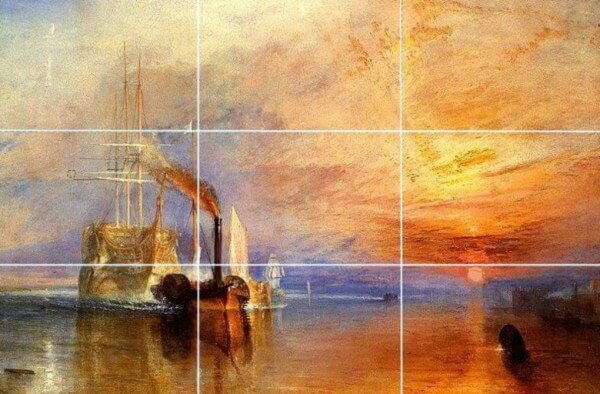 Applying the golden ratio to art means placing the main subjects along intersecting lines, as you’d do when using the rule of thirds. The “phi grid” is similar to the rule-of-thirds layout but the parallel lines are closer to the center. This results in nine boxes that are not uniform in size. The top section of the grid is perfect for landscape pieces. The grid divides space on the canvas mathematically. Works well for images where weight should be toward the frame’s outer edges. 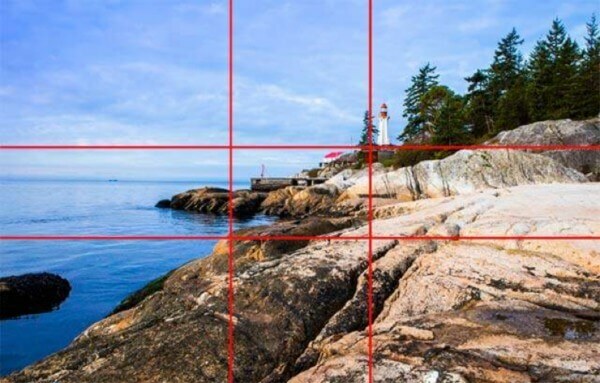 The phi grid can be harder to create than the rule-of-thirds grid. It may leave awkward blank spaces in your work, if you aren’t careful. 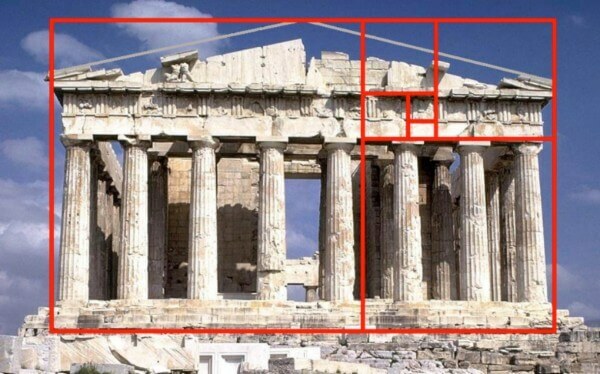 The golden ratio is harder to implement than the rule-of-thirds grid, so why bother? Well, the phi grid allows you to work with the sweeping arc of the Fibonacci spiral. When you place your subjects of focus along this curved line, you are drawing your viewers’ eyes to the spiral coil. It’s like a subliminal sign showing them where to look. We all recognize when a piece of art has “it.” You can’t stop staring at the image, it seems perfectly balanced and just feels right. 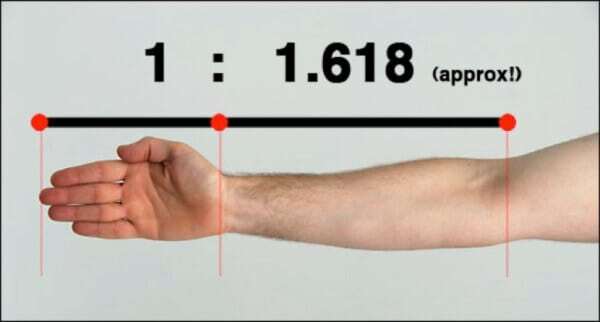 This is what the golden ratio can do. And using the Golden Ratio in your art is simpler than you might think. There are a couple of quick tricks you can use to insert it into your layouts, or you can plan a little more to fully embrace the concept and have quick access to better composition and all-around balanced and beautiful art. This can be used as a general idea to keep in mind (for instance, visualizing the golden spiral to see if your main point of focus aligns with it) or something more precise. What follows are some techniques for art that is balanced based on the golden ratio. Use these on your drawing tablet, for traditional painting, or even for designing your website. Any rectangle or square (especially ones that use the golden ratio) have areas inside that are visually appealing. This is where you could place a tree in a landscape painting, or someone’s face in a portrait-style piece. 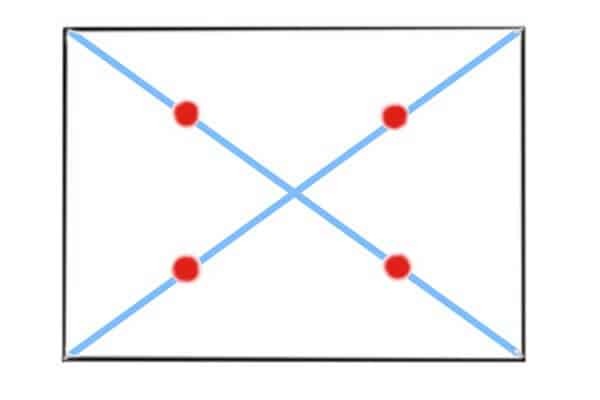 Drawing a line from the top corner to the opposite bottom corner on both sides, making an “X” shape in the middle. From the middle of the “X” to each corner, mark the midway point. The red dots below indicate where the midway points would be. These are the “eyes” of the golden rectangle. Place any items near or within these focal points to draw attention to the subjects of your art pieces. The golden ratio can be used as a sizing guide in photo editing. The simplest way to use the ratio in your design is to crop your images down to form a golden rectangle. This won’t be suitable for every photo you take, but it’s a helpful guideline. You can find a variety of tools that will help with this online and in our tools section later in the article.If you crop your image to create a golden rectangle, you can take it a step further by guiding the shot to reflect the golden spiral, too. And with these simple steps, you’ve just doubled down on your art-composition-balancing! 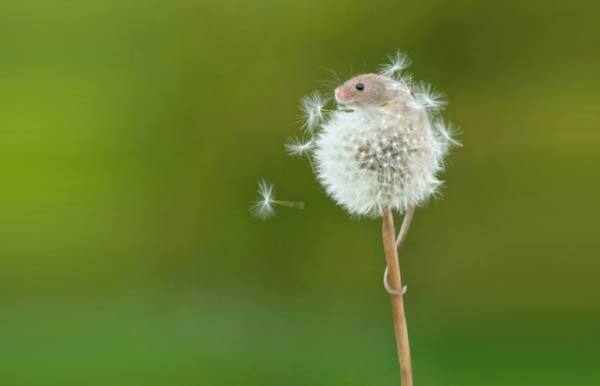 When deciding where to crop, you can visualize the photo with golden proportions with the main subject of the picture in the place that the golden spiral center would be. This is a simple, natural way to add interest to your work and can apply not just to photo editing, but general graphic design. The triangles may be a bit harder to use than the phi grid or golden rectangle as creating a perfect triangle may require a little more math. If you are working with a piece that has a lot of diagonal lines and want to know how to balance subject matter in it, this is a great guide. For those wondering how to use the golden ratio in their composition, the spiral shape is another option for a more balanced piece. Making use of this trick can mean the difference between a forgettable piece of art and a visually stunning masterpiece that pauses people in their tracks. In your paintings and drawings (digital or traditional), there should always be something drawing the viewer’s eye to the composition’s center. This can be several subjects or a line. The golden mean used as a spiral can be visualized as squares and rectangles. This would be a golden rectangle divided by the ratio leading to a series of progressively smaller squares and rectangles. This framework can help you decide where to place subjects inside the frame. The most important focal points should go in the smaller rectangles. 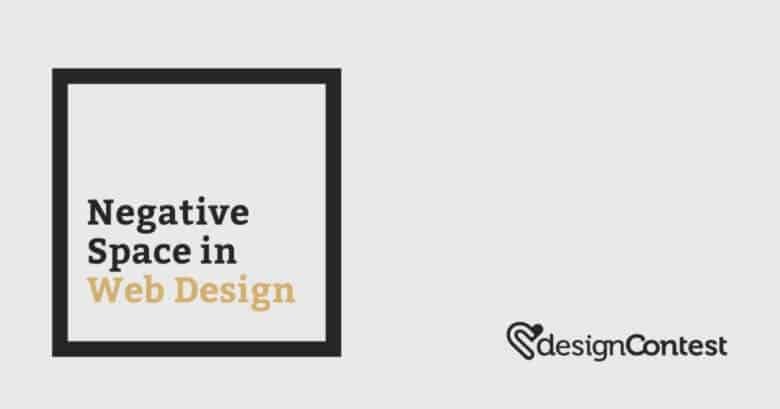 You can also implement the Fibonacci sequence to make your digital designs more appealing. If you are designing the layout of a webpage, for instance, you would arrange the sidebar and content so that it’s true to the 1:1.61 ratio. This can be rounded down or up by a point or so and will still work well. The rectangle spiral can also be a useful guide for where to place text and how large to make it, leading to eye-catching designs and calling attention to the place it matters most. The Fibonacci sequence can also be used to create more engaging, visually appealing logos for your business. Viewers will be drawn to the golden ratio of the design and find it much more memorable and appealing, even if they aren’t sure why. The artistic masters of history were onto to this magical ratio, which could explain (at least partially) their brilliance. “The Last Supper” by Da Vinci clearly illustrates multiple uses of the Divine Proportion. Painted at the end of the 15th century, various architectural and design features display clear golden ratios. 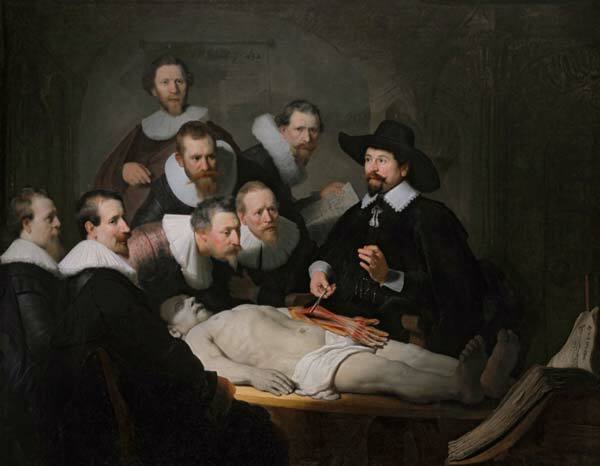 The figures in the painting all appear right below the line that marks the ratio. And if you look closely, it even seems as though the disciples in the image were placed around Jesus in divine proportions. 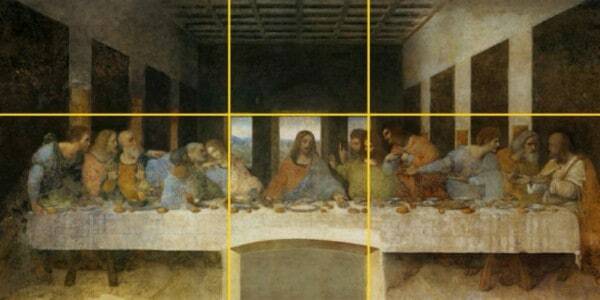 From the way he centered Jesus in the painting, to the height of the figures on his left against the distance between table and ceiling, it’s clear that Da Vinci drew much inspiration from the Fibonacci sequence. Right around the same time he created that masterpiece, Da Vinci was responsible for illustrations in a book titled “The Divine Proportion” (De Divina Proportione). The book discusses artistic and mathematical proportion and how the golden ratio is applied to architecture and art aesthetics. You may be familiar with Michelangelo’s “Creation of Adam” painting on the Sistine Chapel’s ceiling. At first glance, it may not seem obvious that he used mathematics in this masterpiece. If you look a little closer at the segment featuring God and Adam, though, you’ll see that God’s finger is touching Adam’s finger right where a divide exists in the golden ratio. So, it turns out that the harmony and beauty that Michelangelo was so famous for wasn’t only based on his knowledge of human anatomy. He may have also known that structures in anatomy feature the golden ratio and used this knowledge to enhance his paintings. 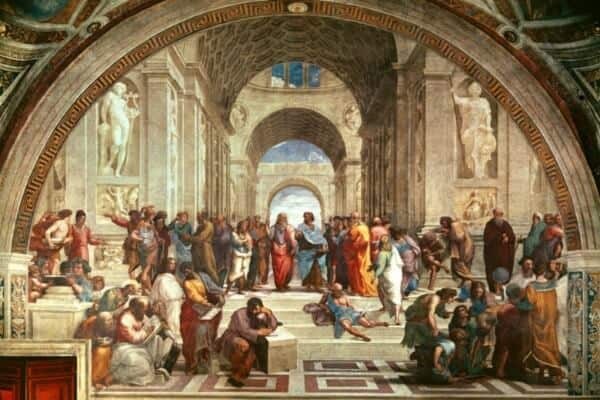 One of the most famous pieces by Raphael is “The School of Athens” in the Vatican, considered by many to be his masterpiece. This is a perfect example of the golden ratio in Renaissance art. Painted in the early 1500s, the image was part of his commission to decorate the Stanze di Raffaello. The golden ratios can be found throughout this composition. See if you can spot them. Other examples of the golden proportion in art are “The Sacrament of the Last Supper” by Dali and The Mona Lisa. It wasn’t just the classic Italian masters who made use of the divine proportion. Here are a few modern artists implementing the Fibonacci sequence in their work today. 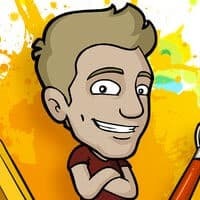 Stephen Silver is an art teacher and character designer with work featured on Nickelodeon Animation, Sony Feature Animation, and Disney Television. Among others, he created “Danny Phantom” and “Kim Possible” and also owns an art school in California. He has talked openly about using the golden ratio in his composition and design. Silver describes the divine proportion as flawless and brilliant because it offers “small, medium, and large” parts of objects and characters. Sci-fi is a beloved genre for digital artists everywhere. Both literally and figuratively, if it wasn’t for Ralph McQuarrie, Star Wars would not exist as we know it. And what kind of world would that be?! George Lucas got in touch with McQuarrie for help visualizing the characters, vehicles, and planets he envisioned for his story. 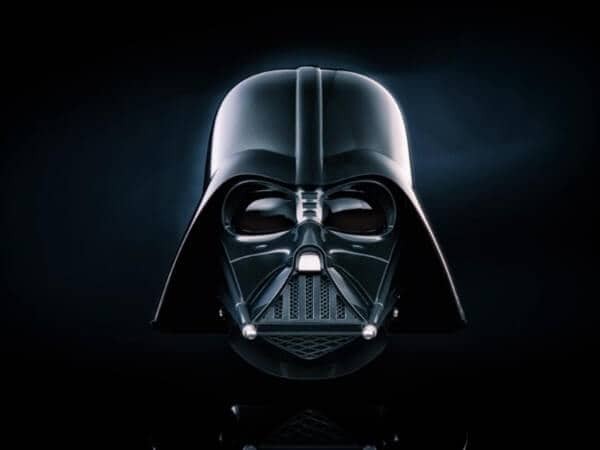 Darth Vader might be the most well-known villain in the history of film, but what if there’s something specific that we find so intriguing about his costumes and helmet? Can you spot any golden proportions in this photo? 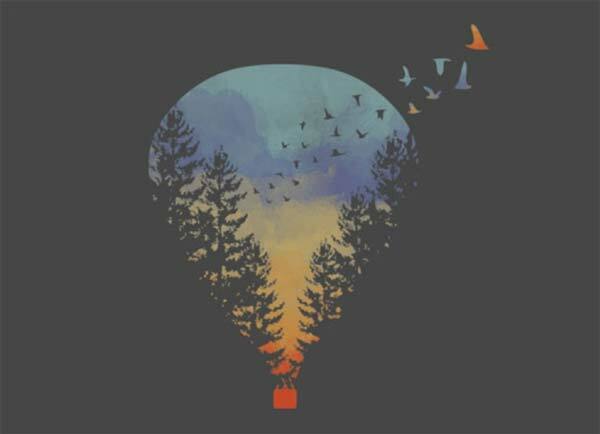 Freelance designer and illustrator Mark Mayers has almost two decades of experience with art. 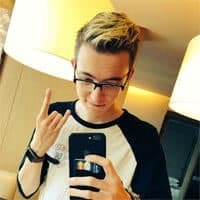 He writes tutorials, has won awards for his artwork, and has openly discussed using the Fibonacci sequence in his game design! There is definitely something innately pleasing in the way he created the visuals for one specific game. DESOLUS is a first-person puzzle game about a surreal world in between dimensions. Mark Mayers started creating this game in 2014. Can you spot his use of the golden mean in this teaser? These are just a few artists who apply the Fibonacci sequence to their work. If you start looking, you’ll probably find many golden ratio examples in art to draw inspiration from. 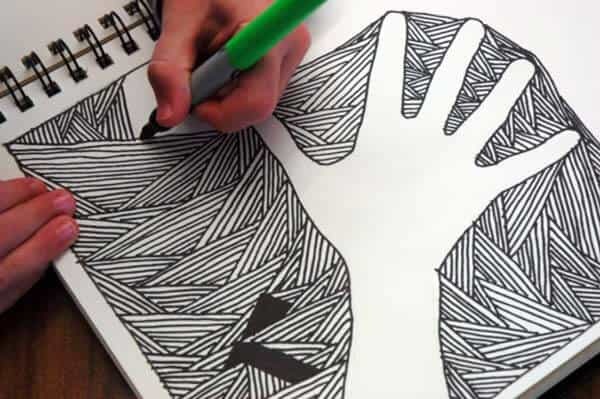 If you are still shuddering at the thought of trying to use math in your art, you can take the guesswork out of the equation by using tools specifically created for the task. If digital art is your main game, this software can be used to enhance your work or check that it’s true to the golden ratio. It’s a transparent grid for Mac and Windows that can be applied to whatever other creation software you’re using. PhiMatrix includes spirals, diagonals, and grids, while the 1.618 Pro version comes with more patterns. The program allows you to choose a template, resize it as you see fit, or use it as a base to create a piece from. You can try it for two weeks on Windows or on Mac for free before deciding whether to continue with it. 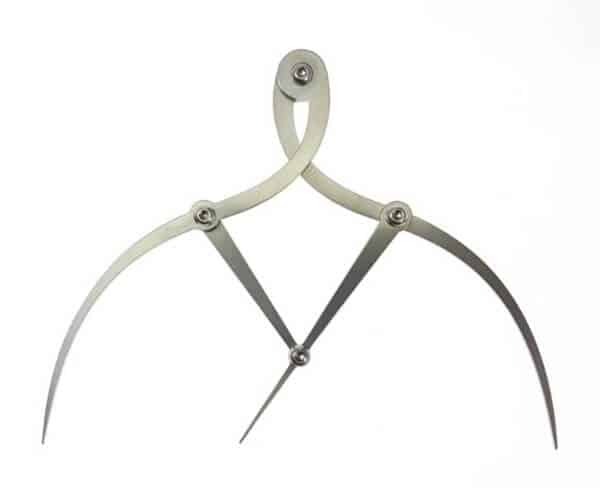 If you prefer to draw or paint the traditional way, Golden Mean Calipers can help you check composition, create balance, and construct perfect layouts. This unique tool can be used to create mathematically sound golden proportions to fill in later, or just to check the proportions of an existing design. These are especially useful if you’re creating art related to body dimensions and anatomy. The caliper arms close and open to measure various distances, while keeping the distances at 1:1618. The dimensions are 1.5 to 12.8 inches for a range of options and the calipers come in a durable holder. This is a quick and simple tool for finding the golden ratio in a specific number. 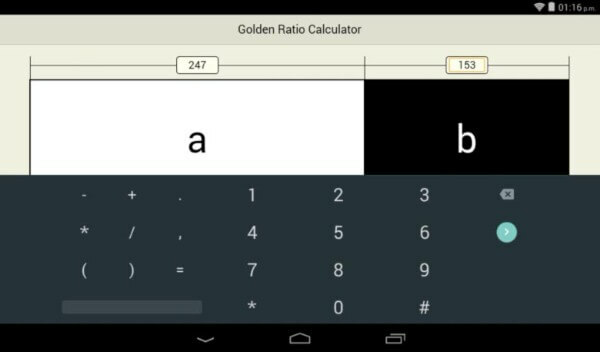 If you need to calculate layout measurements regularly in your developing or design work, the Golden Ratio Calculator can be helpful. The numbers are rounded 2 decimal places, so it’s pretty accurate. The app works with Android 4.1 and up and has no ads (because who wants their creative process disrupted by those?). It works quickly and is pretty easy to use. This can also be used when you’re selecting your canvas size in whatever drawing software you’re using to ensure the rectangle is of golden proportions. Whether you’re a web designer, traditional painter, or have a knack for photo editing, the Fibonacci spiral is your friend. It can be as simple or as complicated as you want it to be, but I like the idea of using a combination of golden-ratio-related tricks in my art. 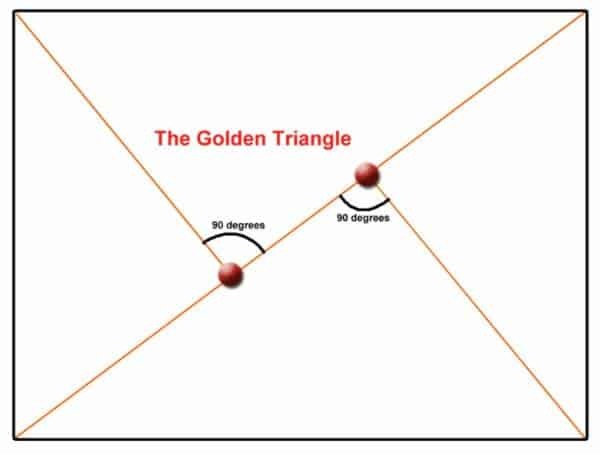 Has this article given you some ideas for how to start implementing the golden mean in your work? If so, comment with your ideas. Also feel free to leave any other questions or thoughts you have on the topic and thanks for reading! What if a simple technique could change your compositions? Did you know that what you don’t include in your art matters as much as what you do? Have you wondered what’s stopping your art from popping the way you wish it did? Then it’s time to learn about negative space in art! The result was often pages covered in busy patterns, literally without an inch of space. I’ve since learned that intentionally leaving some emptiness results in a less crowded and better-looking result. And I’m here to share that knowledge with you, so you can create balanced, eye-catching art. 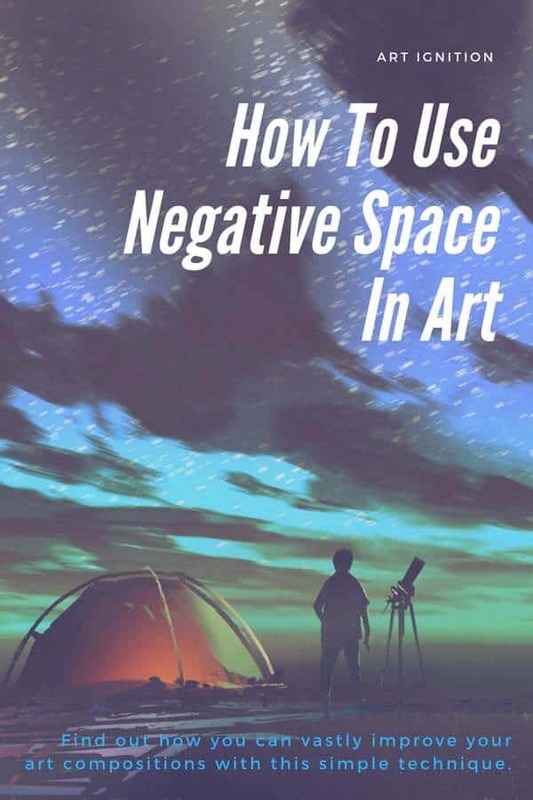 What do positive and negative space mean in art? They are what create the tension in a piece. The interaction between these two elements is what directs your eye where to go when you view a design or painting. What you don’t include (negative space) is as important as what you do include (positive space). Let’s look closer at each definition. 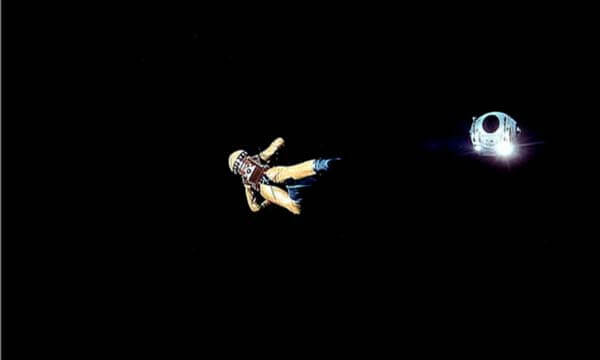 This is essentially the action in your art, or the subject matter. It’s what you’re drawing or painting onto the blank space, or the shape created by the space. In the piece below, the tree is the positive space. This is the canvas or background that shows through or surrounds your subject matter, but it doesn’t have to be white or completely blank. 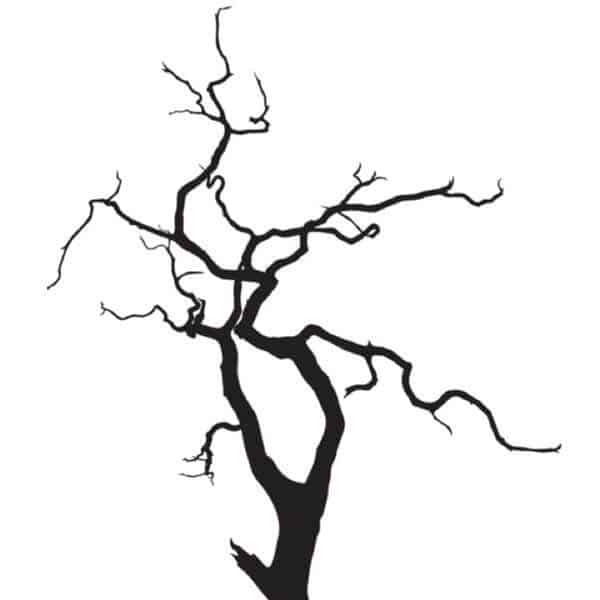 In the image above, the white areas surrounding the tree is the negative space. This is a simple example, but we’ll get into more complex interplays of negative space vs positive space later. 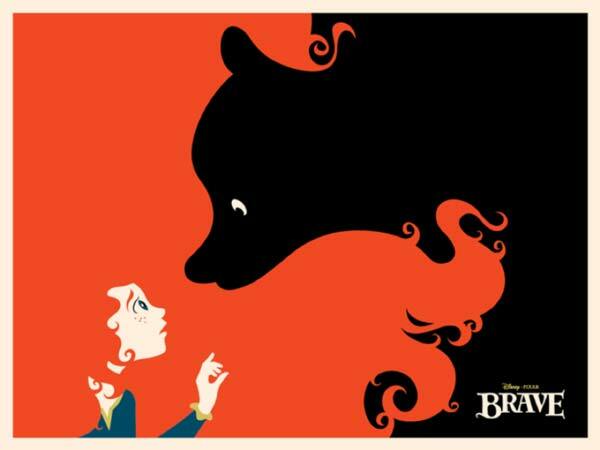 There are a number of convincing reasons to start prioritizing negative space in your artwork. Negative space draws your eye to the subject of your art, giving it space to breathe. When you use it correctly, it gives a natural balance and sense of “rightness” to your composition. Getting it right can be tricky at first, but becomes easier with practice. Try focusing on the empty spaces around your subject next time, and you’ll end up with more balance in your work. It’s the space around your points of focus that will determine how they look in your finished art piece. Most people don’t appreciate compositions that are too full as they can feel chaotic to look at. The brain grasps for something to focus on and instead gets confused because there’s too much action and not enough space. Allowing your subject(s) plenty of room to breathe lends them definition and allows the viewer to know what to focus on. If you’ve been creating art for long, you are already familiar with the challenge of making realistic 3D shapes on a flat, 2D surface. Leaving negative space around the 3D objects you draw creates a more convincing background, making the objects pop more. And you can even use the shapes of the negative space around an object to make more realistic 3D shapes. We will cover this soon in the “Negative Space Drawing Exercises” section. 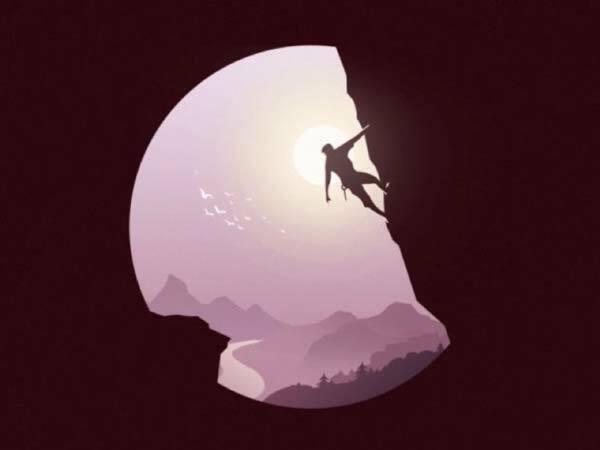 Our brains love to take shortcuts (even at our own peril) and do things the simple way. Viewing art is no exception to this human tendency. When you’re looking at a photograph or painting with the correct use of negative space, it allows you to appreciate the composition without much mental effort. Instead of trying to decide where to look, the viewer’s eye knows where to find the point (or points) of focus and can spend more time appreciating those. Experiment with creating a drawing that is mostly negative space. Instead of placing your main subject in the center, for example, try placing it in one of the corners and leaving most of the page blank. Again, the negative space doesn’t have to be white. This photo is a good example of an arrangement that is mostly empty space (the water). As you can see, the background (negative space) and objects are interchangeable and overlap. The piece has a natural border around it from all the black space used, making the piece come to life. Experiment with using positive and negative space in varying ratios until you get a feel for balance. For digital art, you can experiment with different aspect ratios when you crop to find a good balance. Practice drawing the negative spaces around an object instead of the object itself. If you’re drawing a human figure, for instance, it’s easier to draw the blank spaces between and around body parts than the actual parts. This is because we have fewer preconceived notions about what shapes blank spaces should be. Do you have a signature image that represents your business? This image can be placed in white over a color background, or in color over a white background. Or you can use a cut-out to form that image as evidenced by the image below. This is a familiar example of logo design that utilizes negative space in a clever way. The Facebook logo blends positive and negative space to make a cohesive image. The “F” is part of the background, making the subject of focus and negative space interchangeable. Next time you’re framing a photo, adjust it with negative space in mind. 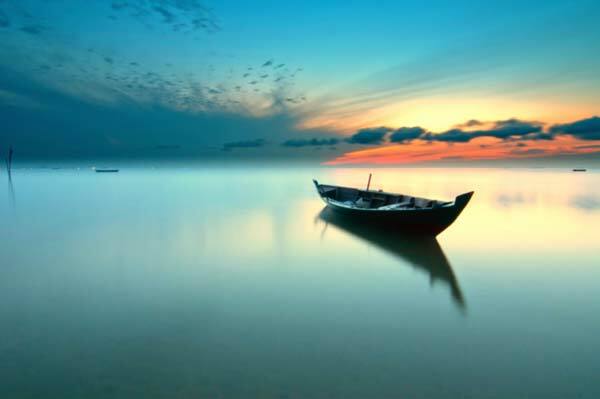 Leave more emptiness than you feel you “should,” as it can be tempting to want to fill every blank space when that’s the habit you’re in. You can even look through old photos and play around with different ratios to get familiar with using more negative space. The example below is mostly negative space with a well-placed border that places obvious focus on the text. Even the text within the border has extra breathing room, making the design feel clean, simple, and straightforward. Simple is better in graphic design because your message will come through much clearer when there isn’t clutter surrounding it. Resist the urge to fill up the page with subject matter and viewers will have an easier time remembering your message. Although negative space is more about what you don’t do than what you do, it takes time to master the concept. Most artists are used to focusing on their subject, so switching to focusing more emptiness might feel strange to you at first. But your compositions will benefit from practicing this. This is a composition exercise you can do with traditional drawing methods or in digital design. To do it with digital artwork, you’ll just need to try out different cropping sizes and positions. You can place your subject of focus in a corner, for instance, instead of the center. For traditional art, you can get used to thinking of different compositions with plenty of negative space by using borders. Draw something to use for this practice exercise. It can be a tree, animal, human figure, or all of the above. Just make sure to leave plenty of space between objects. Now you’re going to make borders using cardboard or craft card, creating different sized “windows” you can place over your drawing. Place your homemade border over your drawing and move it around to get ideas for how to use negative space. You’ll eventually get some new ideas for composition in art that you might never have seen before. This exercise will help you with making realistic 3D shapes on a 2D surface. Find objects around your home that you can draw from different angles, focusing on the way the negative space changes around them. For the best results, pick an object that has holes in it, such as a cup with a handle, or a chair. Look at the gaps inside of the object, seeing their shapes. Silhouette drawings can involve leaving the subjects of the art white while filling in the rest of the page. It’s a good exercise to practice placing more emphasis on the space surrounding the main focus objects rather than the objects themselves. Another option for playing around with silhouettes to practice with negative space is figure ground reversal. This involves taking a black and white piece of digital art and reversing the black and white tones. Since the subject would typically be in black with a white background, this reversal will make the negative space (and the shapes it forms) more apparent. The image below, Rubin’s vase, is a famous example of exploring positive vs. negative space with tone reversal. Bonus points if you can also make yours into a successful optical illusion! Now we’re going to cover some brilliant examples of negative space art. Maybe some of these will give you design inspiration and a few ideas for your own work. In this brilliant, classic example of negative space, the sky is relatively empty, drawing the viewer’s eye to the stars. The mountains and trees are solid enough in comparison to effectively frame the town as positive space. This piece was done as a Halloween brand campaign. 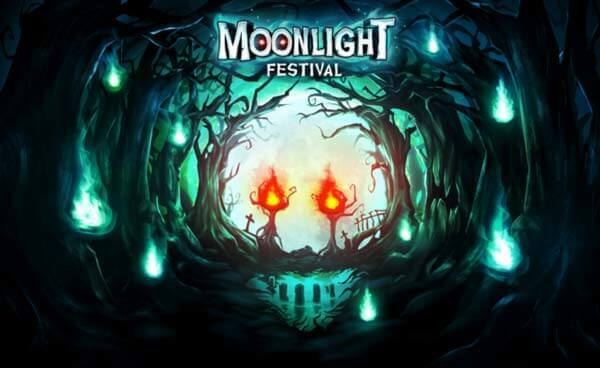 The artist used a clever negative space approach, making the dark forest and moon form a skull. I also enjoy how the green flames appear to illuminate the empty black forest surrounding the focal point. Tang Yau Hoong is one of the modern masters when using negative space in his art. 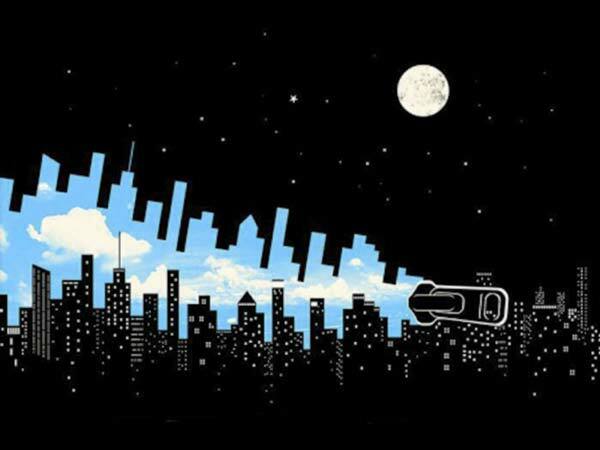 Here, the negative space (sky) is being zipped away to reveal another sky, which is also forming buildings along a cityscape. Depending on how you look at it, the blue sky can also be seen as a type of negative space. 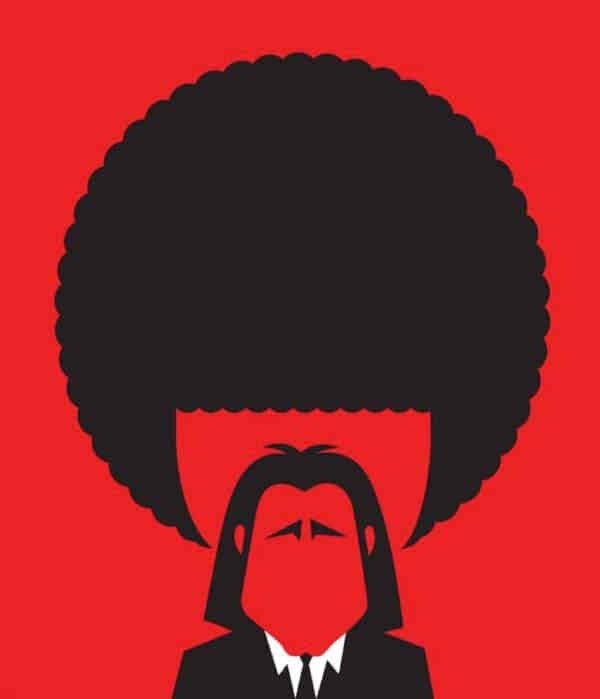 At first glance, this illustration by graphic designer Noma Bar just looks like Jules from Pulp Fiction, but look a little closer and you’ll see Vincent Vega in front of him. It’s impressive that this image is so clear even though it’s mostly solid space. Alright, so this one’s a little creepy, but this Rembrandt piece is an undeniably great display of well-proportioned negative space. 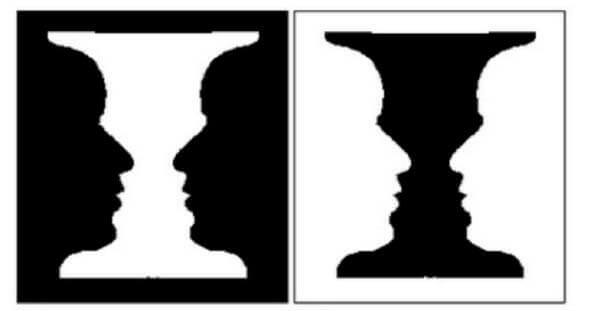 The positive shapes (heads) on the left even seem to melt into the black negative area of the background, framing the photo and drawing in the eye. Here’s a familiar, famous example of a balanced piece of art with plenty of negative space. 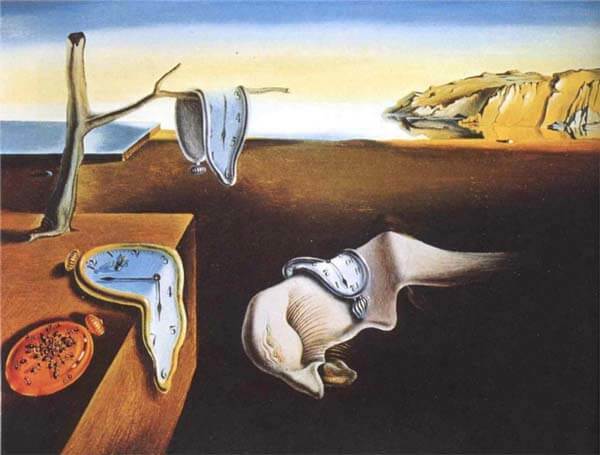 The Persistence of Memory by Salvador Dali has obvious subjects of interest surrounded by emptiness. The brown of the ground and yellow and blue-hued sky frame the central points of focus beautifully. 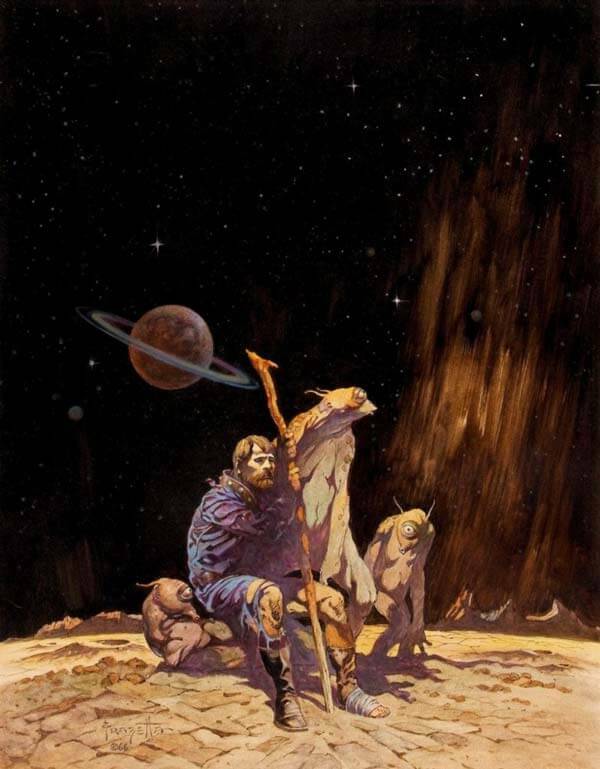 Frank Frazetta is best known for paintings and comic book covers. In this piece of sci-fi art, the character and his four Cyclopean buddies appear to be stranded out in space, surrounded by empty blackness. 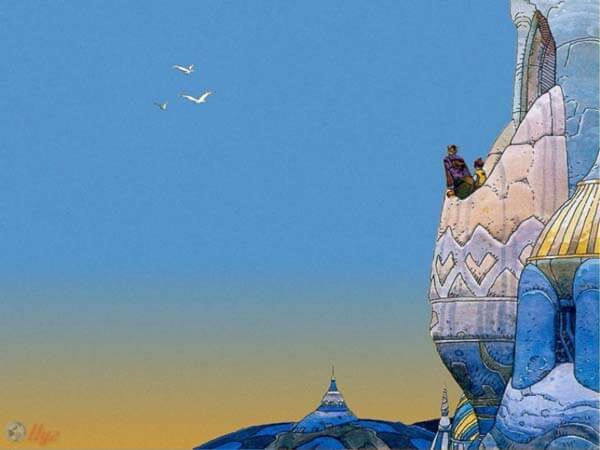 This illustration was done by French artist Jean Giraud, with the pseudonym “Moebius,” and is made up of mostly negative space. The positive shapes in the piece make a nice, balanced frame for the almost empty sky, giving the picture a spacious feel. 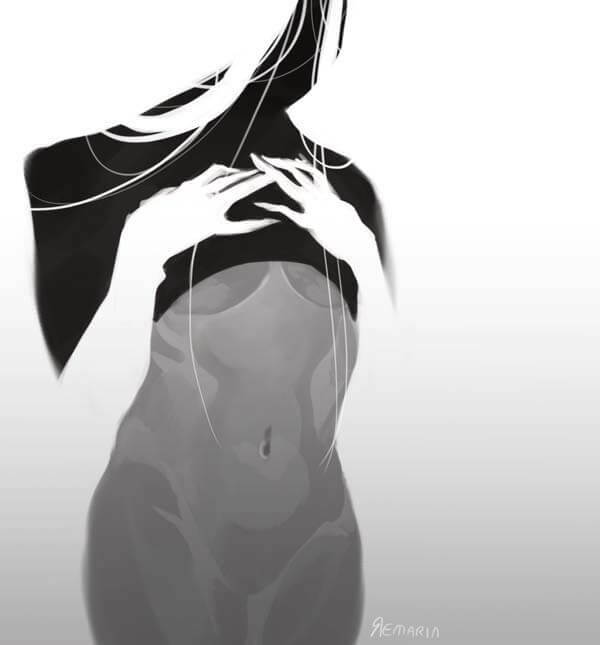 In this piece, the white blank space in the background forms a positive shape on the top of the woman’s shape, successfully merging positive and negative space. When your mind must fill in what you don’t see, it makes viewing the art into a unique, memorable experience. 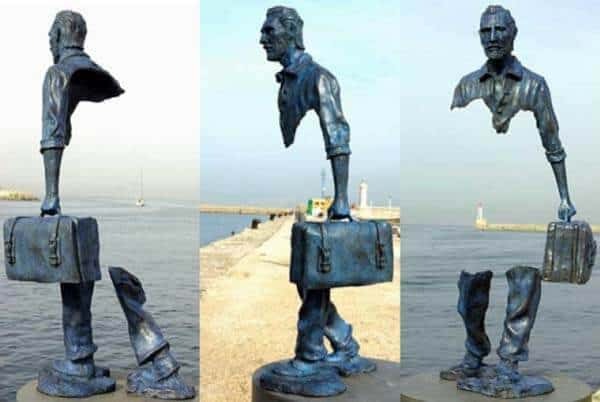 This sculpture, “Missing Pieces” by Catalano, goes well with its surroundings, allowing the viewer to see the far-off horizon where the man’s torso should be. Again, the mind has to fill in the missing pieces, which makes viewing it fun. This painting by Octavio Ocampo is a good example of negative and positive space coming together in an unexpected and appealing way. 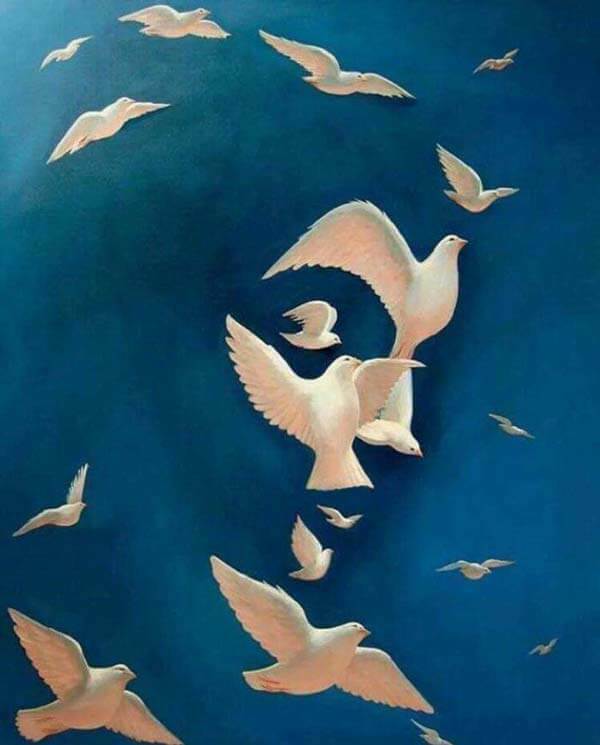 This artist is known for creating “puzzle portraits,” which are mostly optical illusions with sky backgrounds and seemed to count on Gestalt principles for cohesion in his art. 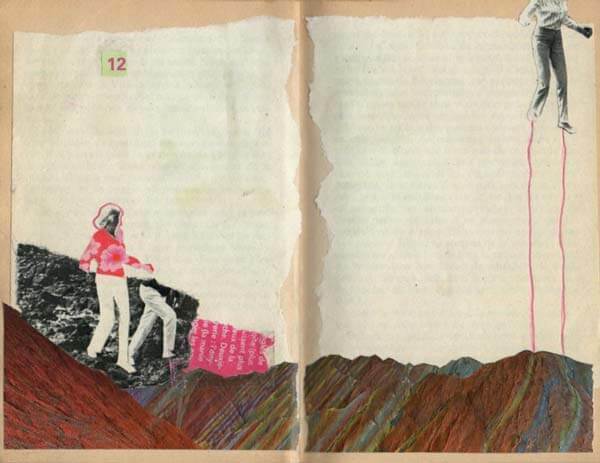 This collage piece is quite empty, but still feels complete due to the way the artist used the blank pages. A couple of figures (one with an upper-half made of negative space) traverse a striped landscape while their friend is beamed up by aliens. That’s what I like to think is happening here, anyway. 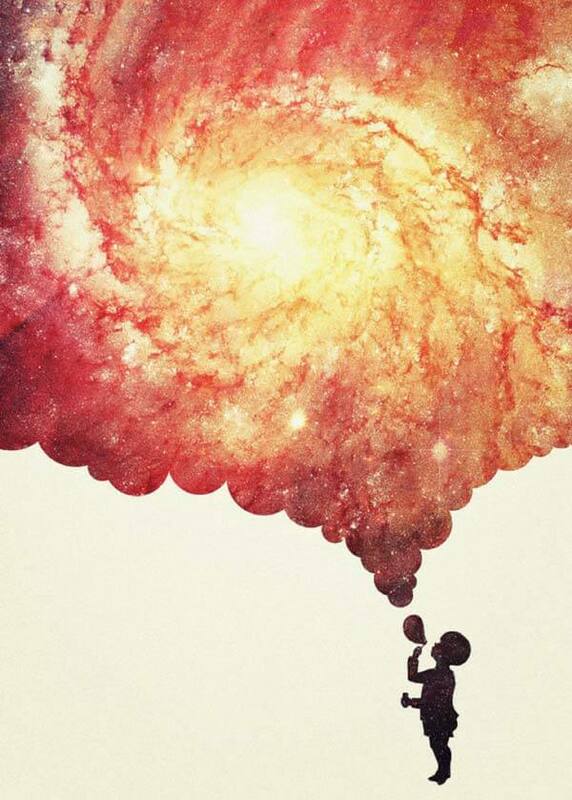 In this art by Philipp Rietz, the positive shapes (the boy and the gigantic bubble cloud he’s making) are actually made of space, which would typically constitute, well, the space behind art. Another smart and mind-bending switch of positive and negative shapes and space. I’m a huge film fan and one of the best movies of all time (visually speaking) is 2001: A Space Odyssey. Kubrick was definitely knowledgeable about the art of negative space. Would this scene be as impactful if it were cluttered or shot closer up? I think not. The scene is also completely silent, successfully transporting the viewer into vast emptiness. I struggle to figure out the meaning behind Moonassi’s work, but he remains a favorite anyway. 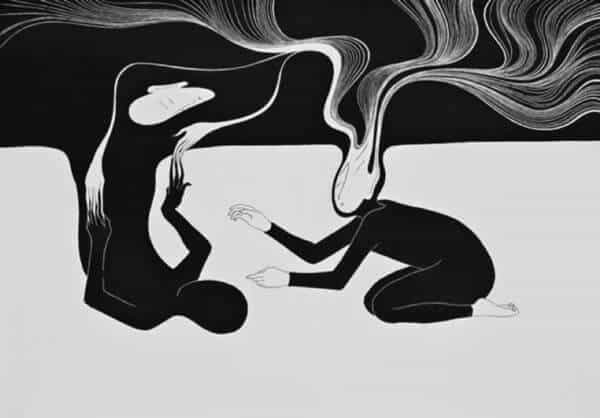 In the piece above, the figures rest on and seem to interact with white space, while their bodies appear to be made of black space. Which is positive and which is negative? It’s hard to tell and creates a pleasant mind-bending effect. 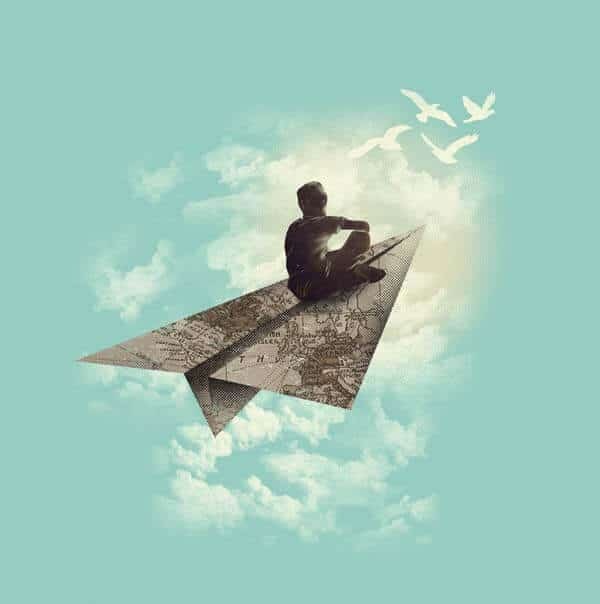 The artist’s depiction of the sky is convincing because of the empty space he left around the character. While the piece would still be nice without that, it’s more impactful this way. 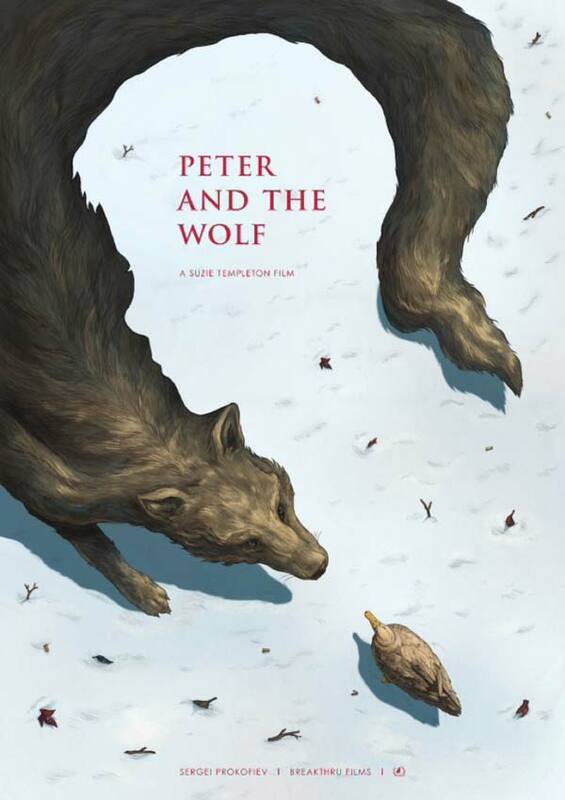 In this book cover, the negative space showing through the shape of the wolf reveals a boy’s profile, alluding to the subject and title of the book. The shape left by this carved out negative space makes the perfect spot to put text, drawing the eye in. In this photo, it’s hard to tell where the water ends and the sky begins, making the background one big, blank white area. Though minimal, this work of art has a clear feeling of solitude to it, made possible by all the space. 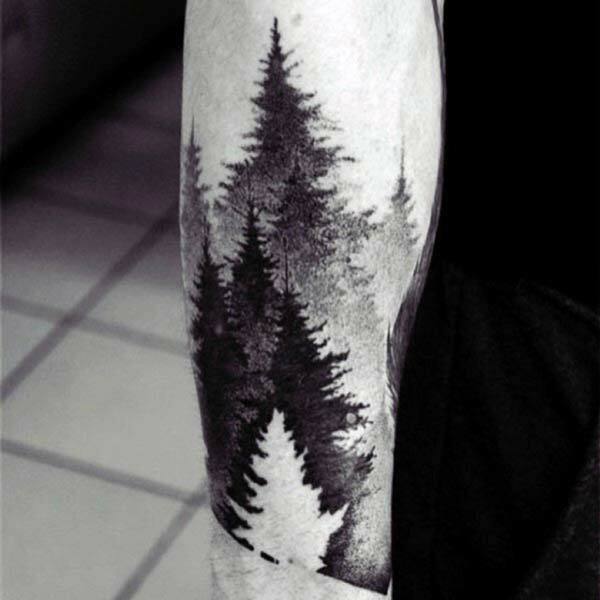 In this unique tattoo concept, negative space is used to form a positive image of a tree, as the rest of the trees fade into the negative space of the person’s skin. Pretty clever, if you ask me! 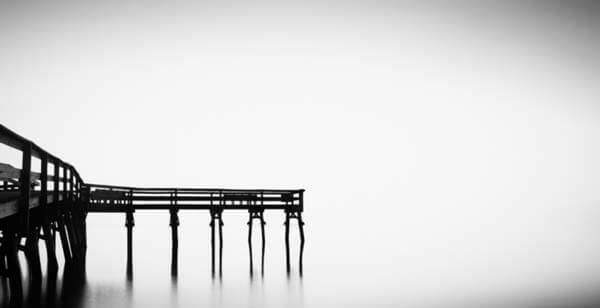 Ready To Work With Negative Space? 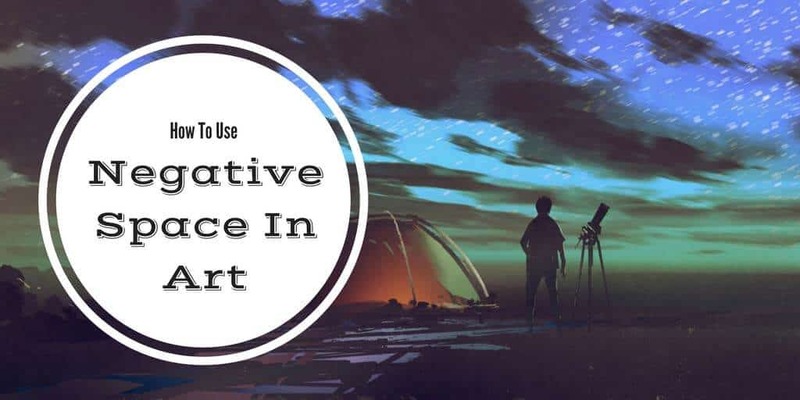 Did you enjoy this tutorial on negative space in art? Playing around with this simple principle can really take your work to new heights. In fact, I had to pause writing this to paint an idea I got for using negative space in a new way. Feel free to leave your thoughts in the comments and share the article if you enjoyed it! Thanks for reading. What Is The Best Drawing Tablet For Beginners? Do you want to take your art to the next level? Getting started with digital art can be easier than you think. Maybe you’ve been drawing your whole life and need a change. Or perhaps you’re hoping to stay professionally relevant in our increasingly digital world. Whatever the case, a tablet is the next logical step after traditional drawing. 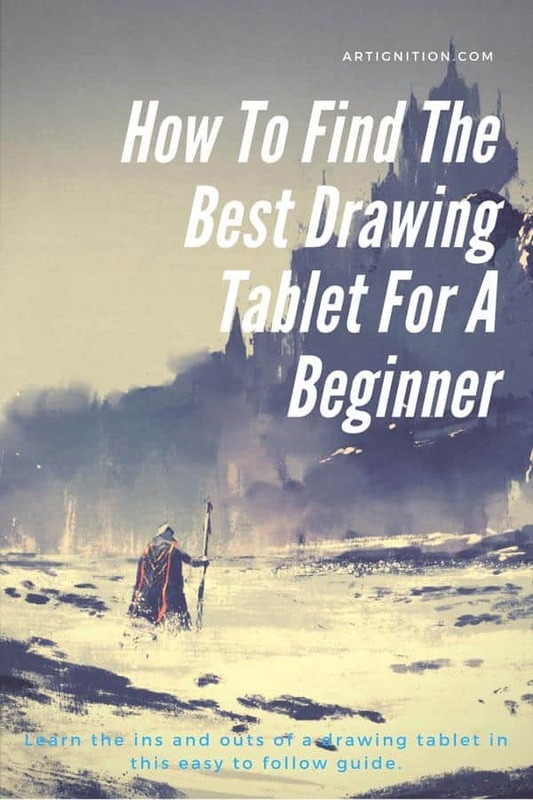 Here, I’m going to help you find the best drawing tablet for beginners. Paper like texture can wear out nibs faster. An excellent beginners tablet, the Wacom Intuos Pro is a well rounded drawing pad. It's extra features will allow you to continue to grow as a digital artist without having to buy a new tablet in a couple of years. A tablet for drawing will give you a new set of challenges artistically and enable you to write, paint, share, and upload your digital art easily. If you’ve been stuck in a rut with your art for a while, the right device could reignite your inspiration. A tablet opens the door for matte painting, video editing, and photo manipulation. It enables you to store all of your creations in a single place, meaning no more bent or ruined drawings. And if you’re interested in game design or hope to become a concept artist of any kind, getting one is essentially unavoidable. When you’re drawing with ink, you obviously can’t erase. While drawing with pencil, erasing too much can permanently smudge or damage the paper. Working with a tablet, however, means banishing a mistake is as easy as using the “undo” feature. Alternatively, you can paint over or erase mistakes. As someone who has destroyed many sheets of expensive drawing paper by erasing too much, I consider this feature a welcome change. A single tablet stylus can function as an entire set of brushes, markers, charcoals, pastels, and as an eraser. This universal tool can be used to cover your screen with ink, “oil” paints or “acrylic” paints, or to mix them into something unique. If you enjoy creating mixed media art but not keeping track of a ton of supplies, this eliminates that hassle for you. Programs like Photoshop allow you to extend your artwork with other tools that aren’t related to drawing or painting. These tools wouldn’t be possible with traditional forms of art but can be accessed easily on your tablet. Warping is a good example of this. With traditional drawing, filling in an area requires carefully shading or crossing lines, both of which are time-consuming. With a tablet, on the other hand, this task can be as simple as using the Paint Bucket Tool. You can use copy/paste to reuse an image instead of having to tediously sketch it out by hand. You also get the advantage of a single surface to make all your creations on, instead of needing to constantly restock paper and other art supplies. When I paint, it seems like half of the experience is getting the canvas ready, hunting down my brushes, and laying down newspaper. Traditional art requires a lot of general set-up tasks. A tablet can cut out all of that extra preparation, letting you focus on what matters most; creating your art. Choosing the best tablet for your needs can be the difference between sticking with digital art for life or quitting right away because it doesn’t go smoothly. 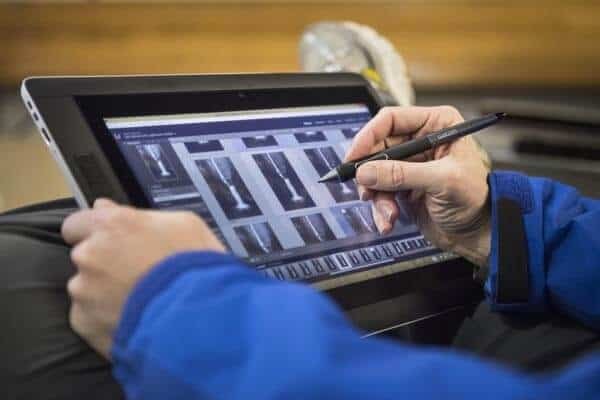 Bigger Tablets: For some styles of art, such as life drawing, clean and continuous lines are an important part of the process. If the style you work in calls for this, it means you should use your arm to draw instead of your wrist. A larger tablet makes this much easier as there’s more screen space to work with. Smaller Tablets: A smaller tablet is, of course, easier to carry around and makes a better choice if your main concern is portability. A small surface area could be all you need if you like to focus on intricate details instead of drawing with large, sweeping motions. Another benefit to choosing a small tablet is that they are more affordable. If you’re specifically seeking an inexpensive tablet, keep that in mind. Medium Tablets: In my opinion, you can’t go wrong with a medium tablet. They are still light enough to transport easily but offer you enough drawing space. I find that different environments affect my creativity and like to switch it up often, so portability is always one of the first things I look for. They also aren’t as much of an investment as bigger tablets, typically. And if you choose an affordable medium option as your entry level drawing tablet now, you can always get a bigger one later. All good drawing tablets for beginners should come with convenient connectivity options. This means easily connecting to your laptop and desktop computers. And if you’re using a drawing tablet with a screen and like photography, maybe your camera too. The majority of modern computers will connect with HDMI or a USB cable, while cameras will use USB or HD. You will notice a wide range of options when it comes to price, from inexpensive tablets to advanced devices that cost thousands. Although money is always a factor when making a purchase, it shouldn’t be the main deciding factor for your first digital drawing tablet. As someone who used to always buy the cheapest products just for the sake of saving money, I’ve learned the hard way that quality matters more than trying to save a few bucks. But finding something affordable, comfortable, and long-lasting is the ideal. You’ll find a variety of prices on this list and a tablet for every budget. When you’re just figuring out how to use a drawing tablet, it will take time to learn its pressure points and sensitivity. 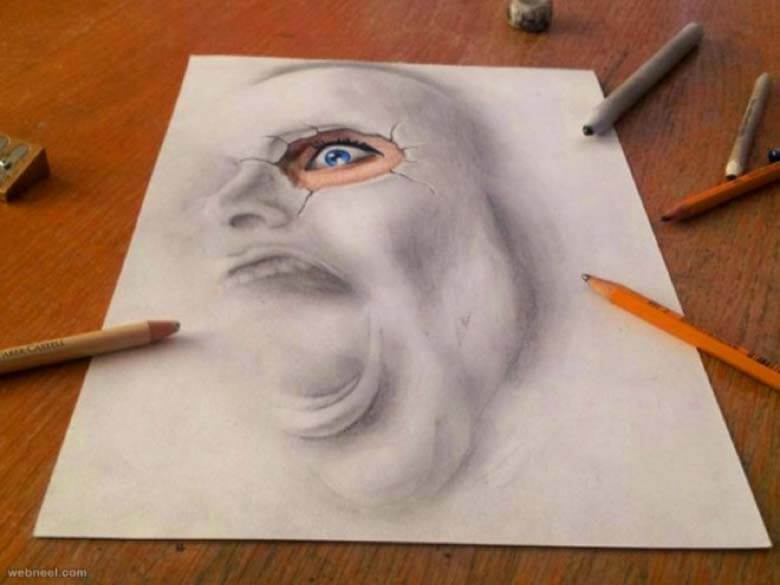 Think about learning to draw with a pencil as a kid, it took a while to gain precision. It will also require some time and practice to get used to a drawing tablet and that’s perfectly normal. 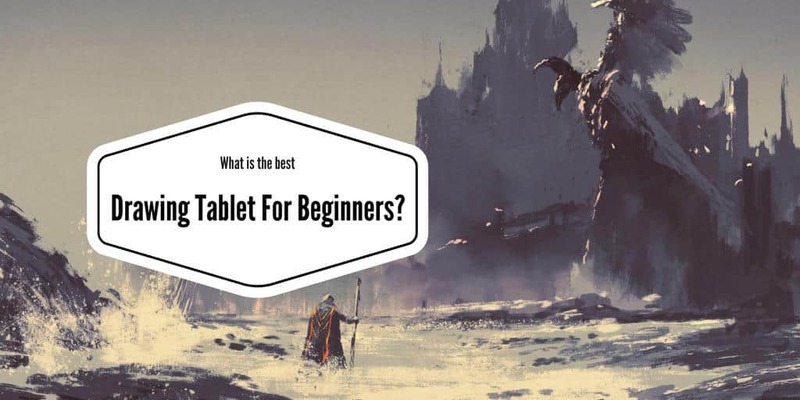 If you are wondering what are the best drawing tablets out there, below I list my top 5 tablets for beginners. First, I will cover three drawing tablets (without displays), followed by two tablets with screens. 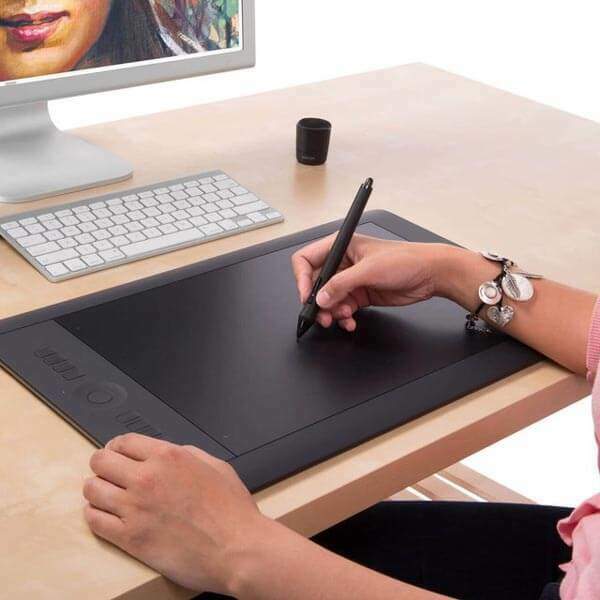 The Intuos Pro is 9.9 by 15 inches in size with a usable drawing space of 5.5 by 8.8 inches. If you are interested in using your tablet for detailed Photoshop tasks or drawing illustrations, this size should work well. One main advantage for beginners is that the Intuos Pro has a textured surface with resistance. This has a more familiar feel and eases the transition from paper to digital. Multi-touch Capabilities: It's pen and touch capabilities means that the surface drawing space functions similar to a laptop trackpad. This allows you to rotate and scroll images, zoom with pinch and swipe, and more. These features are great because they mean less pausing to reach for your mouse while drawing. Pen and Pen Stand: The Pro Grip Pen has a rubberized barrel and is comfortable to use, meaning you can get lost in your work without any hand fatigue. It comes with an eraser at the top and a switch that you can set to perform click, double-click, and right-click functions. There’s a pen stand included, which is good if you tend to lose track of art supplies. The stand also has a storage compartment in the stand for (included) replacement nibs. Wireless Capability: Another benefit to the Intuos Pro as an entry-level tablet is its ability to function without cords. You can use the built-in Bluetooth instead of plugging it in. Adjustable Area Size: You can configure the active drawing area to your preference. Backlit indicators around the edges will show you where the new borders are. Multi-touch Misreads: I mentioned the multi-touch capability as a pro above, but this can also be a con when the surface interprets an accidental tap as an intentional gesture. If that bothers you, there is an option to turn Multi-touch off. Alternatively, consider getting a digital artist glove to stop those accidental touches. 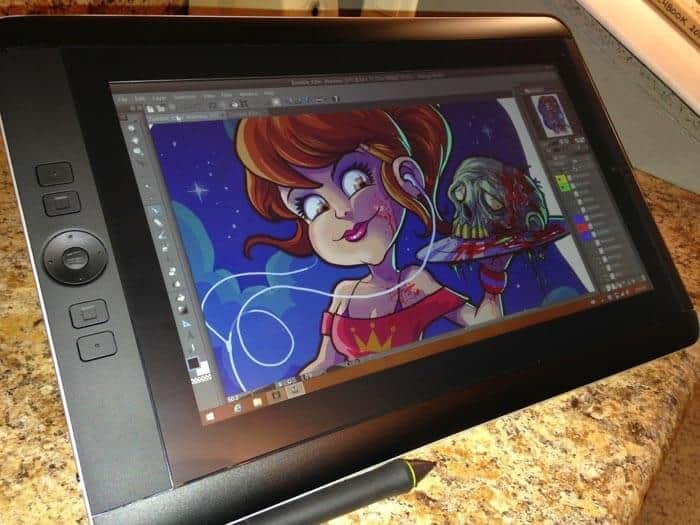 Overall, the Intuos Pro is a feature-rich tablet with a learning curve for newbies. This is something you would probably benefit more from if you’ve tried a graphics tablet before and are pretty certain you’ll stick with it. If you’ve been looking for the best drawing tablet under $100, the Wacom Intuos is designed especially for aspiring digital artists. This drawing pad enables you to edit, paint, and draw with the pen and has customizable shortcuts. Easy-to-Map Buttons: The buttons on the pen and shortcut keys on the tablet are easy to customize, even when you’re completely new to tablets. Set them to hold pressure, pan, zoom in and out, redo, and undo to make your drawing experience more stream-lined and intuitive. Line Variety: You can push the pen at 4096 pressures to create line width variations. If you’re used to using pencil, this could feel like a step up from traditional art since you have a variety of options with a single tool. You can also adjust the opacity or create unique brush strokes with the stylus. Surface Friction: The Intuos has just enough friction to prevent slipping without making the nib stick. You will probably appreciate this if you’re partial to the natural pen-to-paper drawing feeling. Size: If you’re used to sketching on large drawing pads, you might find that this frame feels too small. However, with the new release of the Intuos range, you now can choose different sizes. Pick the one that suits your way of drawing. The Feel of the Pen: Compared with a real pen, the included stylus may feel a little too light. It’s also bulkier near the tip and slim near the back, which you might find unnatural to hold. It also occasionally draws out full pressure dots while you draw. The Intuos is similar to the Intuos Pro but without the multi-touch capability and levels of pressure sensitivity. As a beginner, you likely wouldn’t notice these features missing and the trade off of paying less than $100 could be worth it to you. But if you want to get a product you can become an advanced digital artist with, another tablet on this list could suit you better. In terms of price, the Huion New 1060 is on par with the Intuos Draw covered above and comes with a few more features. The tablet works with programs such as Paint Tool Sai, and Krita. To make your creation process more efficient, you can use the included customizable shortcut buttons. Pen Quality: The included stylus is rechargeable, comes with two buttons, and weighs about as much as a fine tip Sharpie. This will help you adjust to digital drawing since pens that are too heavy or too light can be awkward to get used to. You only need to charge the pen for a few hours and it will work for days. Large Drawing Surface: The active drawing area on the 1060 is 10 by 6.25 inches, a good middle ground to start with for a beginner. Extras: Though it has a medium active drawing area the Huion 1060 is very light and portable. It comes with a carrying case to protect it from scrapes and scratches and a glove to reduce friction for your hand. 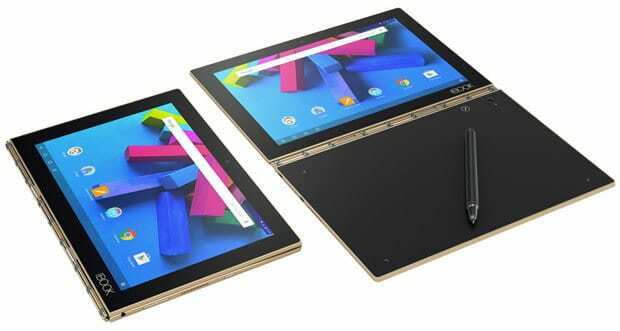 No Wireless Capability: If you prefer working wirelessly, you may want to choose another tablet. This one doesn’t have Bluetooth compatibility. Pen Button Issues: While the pen itself is sturdy and balanced, its buttons are a bit loose and feel kind of cheap. No Touch Functions: The tablet doesn’t register anything except the stylus tip, which you might find inconvenient if you like using gestures while you work. But this could be a pro if you would rather not deal with accidentally activating features with your palm while drawing. Some people have also used the Huon New 1060 for whiteboard sessions and live demonstrations along with ordinary, everyday doodling. If you want a tool you can use for work as well as pleasure, this is a good feature. If you would rather be able to paint and draw directly on the screen, a display tablet like the Artist 16 could be a good place to start. This enables you to draw in a more familiar way instead of having to worry about drawing without looking down at your hand. You will pay more for that function in most cases, though. Medium-sized Screen: I mentioned earlier that a medium screen is a good middle ground for those new to drawing tablets. The XP-Pen 16 has a 15.6 inch display. Since I’m used to painting on canvases around that size, I would find this range comfortable. 178° Viewing Angle: This tablet has an extra-wide viewing angle. This means that even when you tilt the screen, the colors look as they should and contrast isn’t compromised. This is a must since color is the most important aspect in many drawings. Compatibility: When you’re new to using a tablet, it’s important to have the freedom to experiment before finding the program you like best. The Artist 16 supports Mac OS and Windows. It’s compatible with a variety of creative software including Paint Tool Sai, Manga Studio, Corel Painter, and Photoshop. 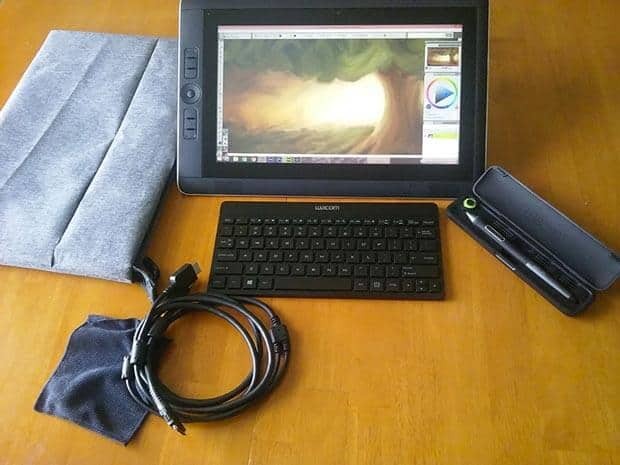 Extras: This tablet comes with an extra rechargeable stylus and spare nibs, a cleaning cloth, HDMI cable, and a glove. You may already be familiar with anti-fouling gloves if you use graphite in your art. But they’re also useful for digital tablets as they help reduce friction. Needs Calibration: In order to get the monitor to display colors accurately, it may need calibrating. Runs Hot: If you think you’ll favor high brightness settings with your tablet, keep in mind that it may run hot. Glossy Screen: The Artist 16 screen doesn’t offer any pen resistance. This is not necessarily a con because some artists find a slippery screen easier to draw on. But the glossy screen does mean more glare and reflection when you use it in brightly lit areas. Other noteworthy features on the XP-Pen 16 are its 2048 pressure levels and adjustable stand. 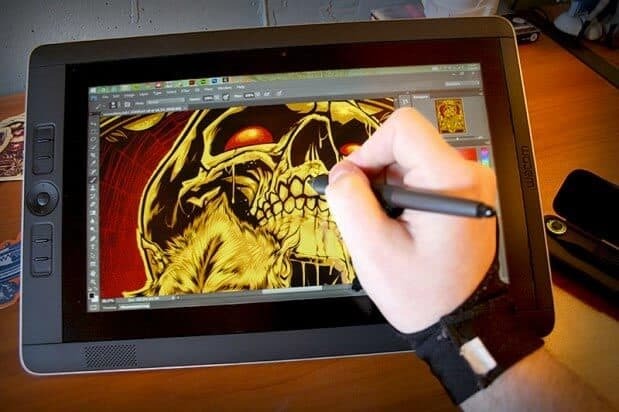 While some higher-end tablets feature higher pressure sensitivity than this, 2048 levels of pressure makes this one of the best graphics tablets if you’re a beginner or intermediate user. 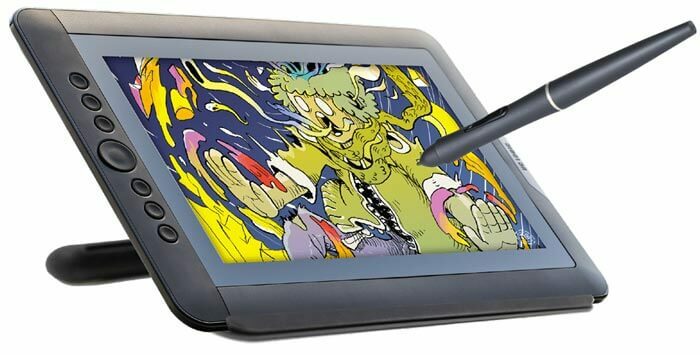 Another drawing tablet that shows a screen is the Huion GT-185HD. If you like to draw with sweeping, flowing motions, it’s a good size. The screen measures 18.5 inches (diagonally) and has solid, smooth edges for comfortably resting your arm as you work. Long-lasting Stylus Charge: Having to charge your art tool can take some getting used to. But the GT-185HD stylus holds a charge for weeks, so you only need to think about it every once in a while. Easy Driver Installation: If you aren’t the tech-savviest artist out there, you will probably appreciate that installing the drivers is easy. You just need to download Huion’s latest, install before you connect, then reboot. Adjustable Stand: This tablet comes with a stand that lets you set the screen anywhere from 15° to 85° this is handy because you can experiment with different angles until you find what feels most natural for you. Included Accessories: The 185HD has an anti-fouling glove included, a screen protector, and a cleaning cloth. Pen Noise: When you’re drawing on the screen, you might get annoyed by the squeaky sound the stylus makes sliding across the screen. Earphones can help, but that doesn’t guarantee you won’t irritate your roommate. Stylus Holder Doesn’t Charge: The 185HD has a stylus holder in back, but the holder doesn’t charge the pen. You have to plug in a separate power cable for charging which isn’t as convenient as a holder that also charges. Detection Issues: When you draw close to the edges, you might notice that the cursor gets unresponsive or jumpy. The GT-185HD is compatible with programs like Sketchbook Pro, Manga Studio, Corel Painter, Illustrator, and more. It has express keys that will let you undo, change brush size, and zoom. Using these will take some time to learn but will speed up your creative process after you get adjusted. If I had to pick the best drawing tablet for beginners on this list, I’d go with the Wacom Intuos Pro. Although it’s not as cheap as the Intuos, the multi-touch capabilities will let you advance with a single device instead of having to buy a new one when you’re no longer a beginner. The adjustable active area will let you experiment to find your preference. Price-wise, it’s in the middle of the road, so you don’t have to make a huge investment before you know for sure whether you like drawing with a tablet. And the fact that it’s not the cheapest means you get extra features to play around with later on.